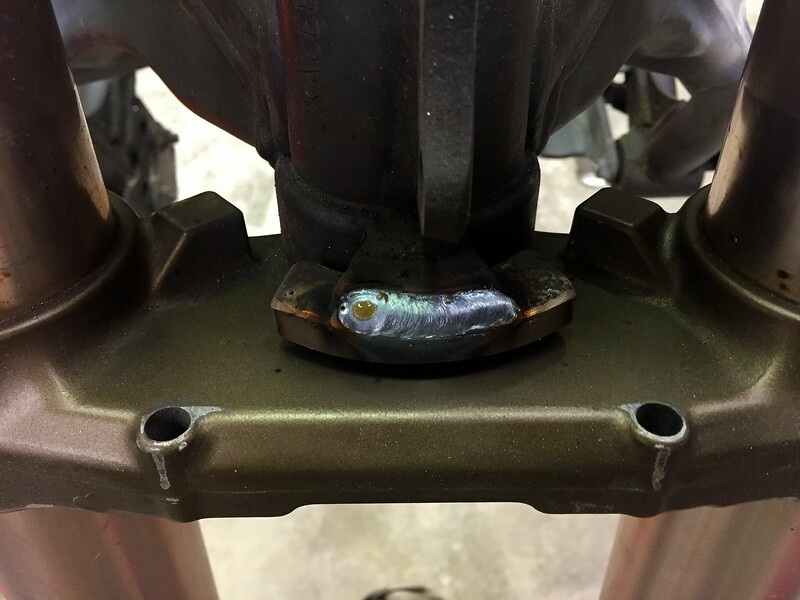 R1 shock bushings, let’s cut right to the chase. 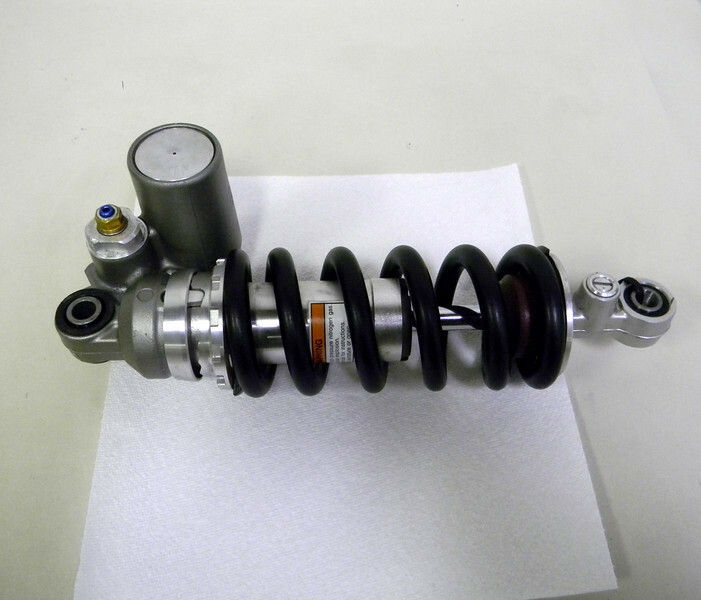 The R1 uses 10mm mounting bolts, while the OEM Versys shock uses 12mm bolts, big freakin’ deal. Ok, it can be a big deal, and has been for some riders according to their reports as they try to make this swap. it doesn’t need to be difficult, let’s keep it simple. As everyone must know at this point, the needle bearing end of the R1 uses a hardened SS sleeve with an ID of 10mm, ya need 12mm. How do you handle this little problem? It’s hardened, ya can’t drill it, don’t bother trying. 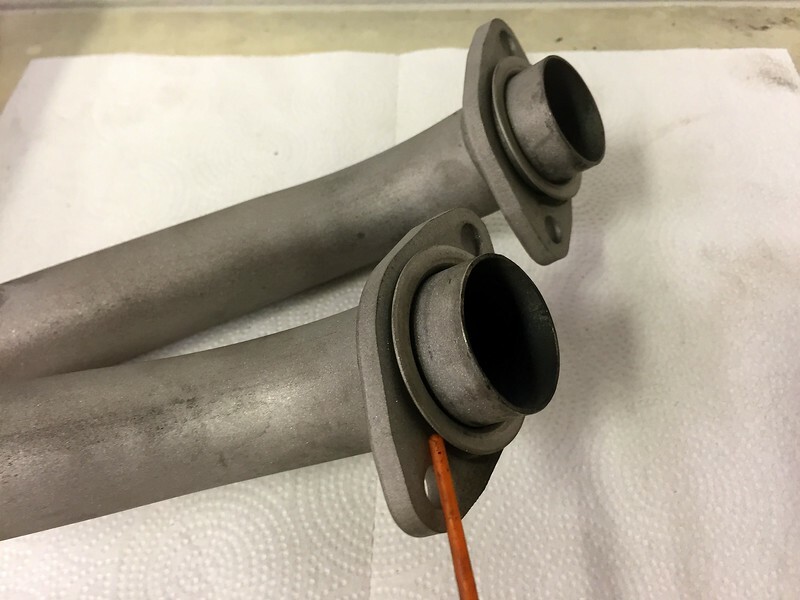 You could have a plain bushing machined from a variety of different materials, source some other needle bearing assembly from an industrial supply, or just have the R1 bushing bored to 12mm and be done with it. C’mon, which sounds easiest? 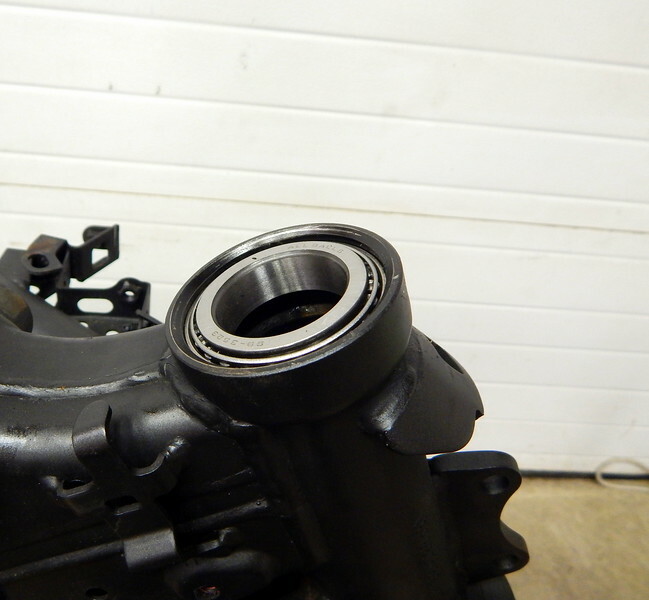 I like the ability to replace the OEM R1 bearing with the same part number if the need should arise. 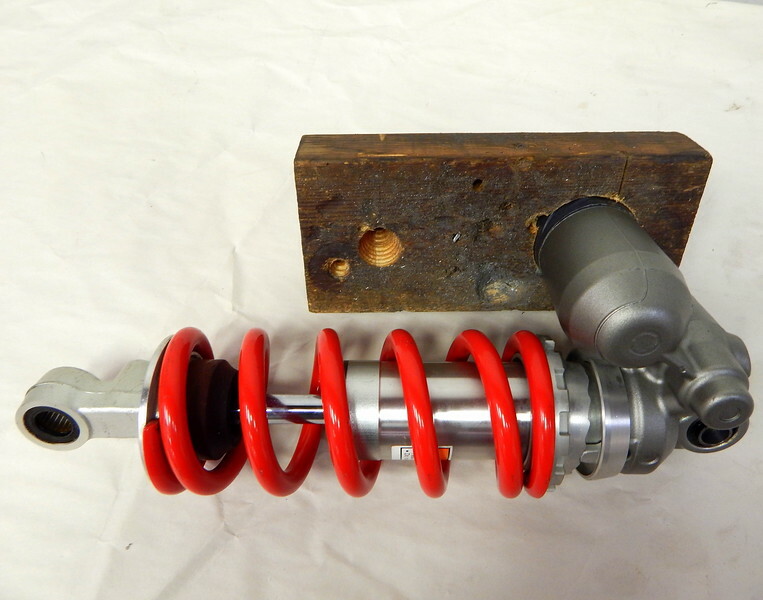 The R1 shock is often sold used with the aluminum shock linkage. 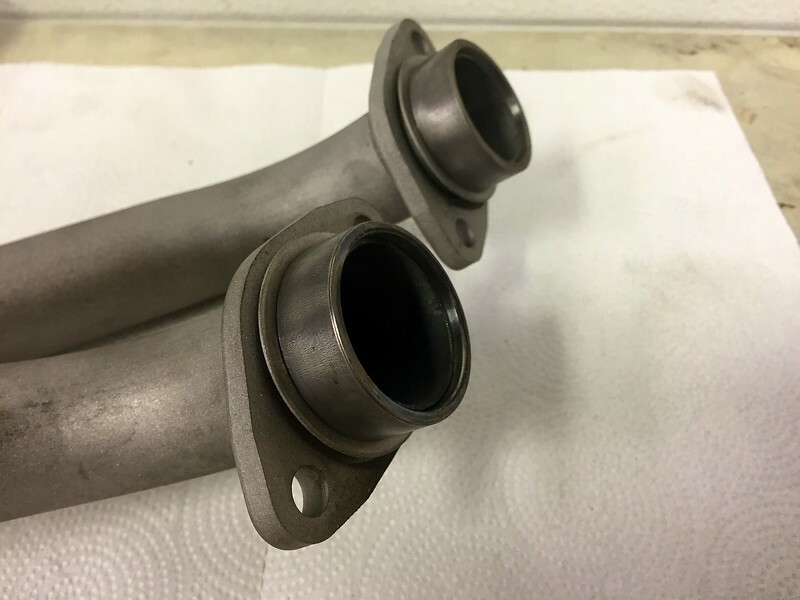 If you get the linkage with your purchase, you’ll find an identical SS sleeve included as a spare. 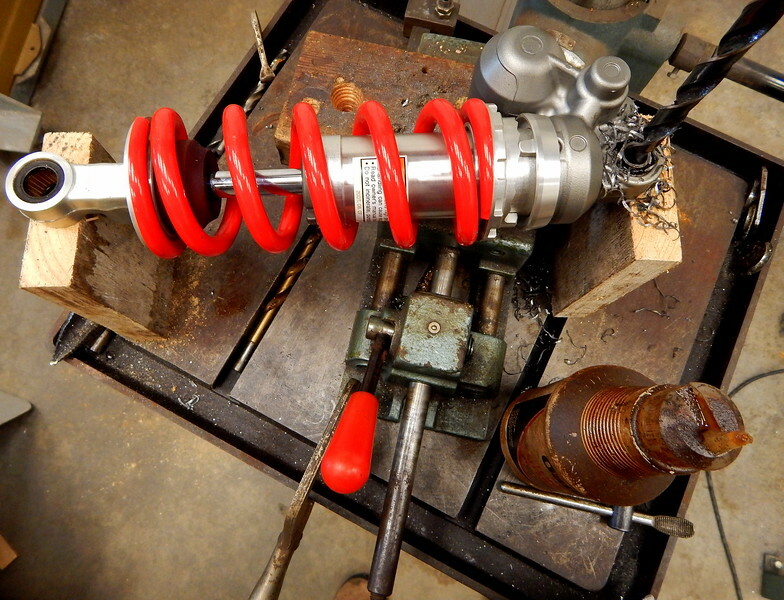 The opposite end of the R1 uses a conventional rubber damped bushing, also with a 10mm ID. 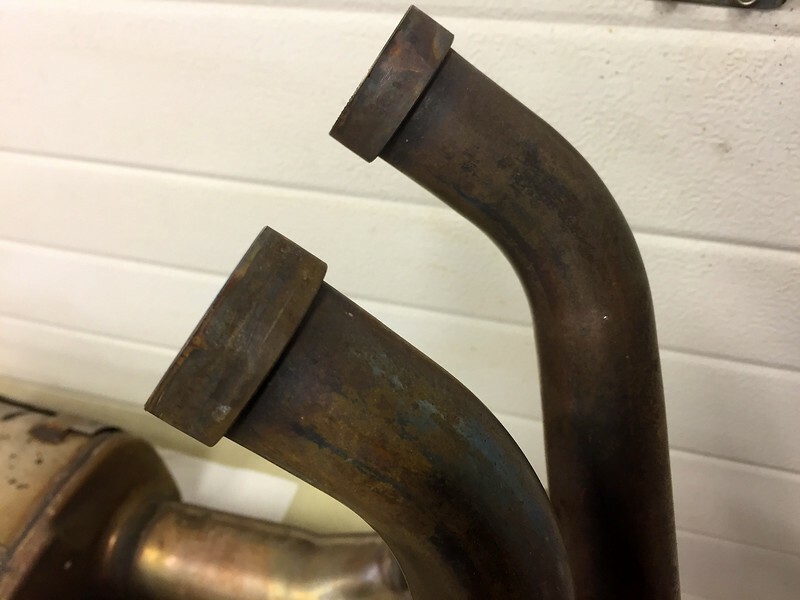 Like the other end, this bushing can be swapped for a machined bushing, or after market industrial needle bearing bushing. 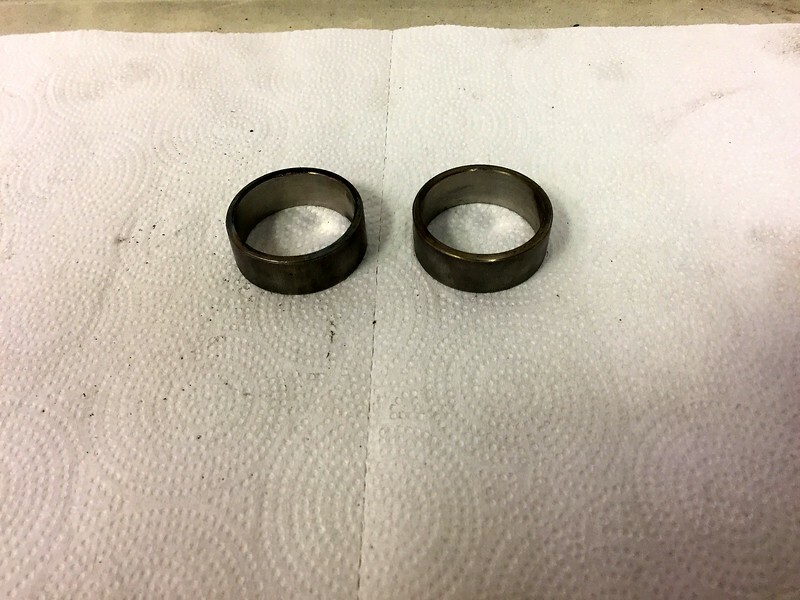 I’ve elected to swap in the ER6/Versys needle bearing with 12mm ID sleeve, or drill the mild steel bushing insert on the R1 to 12mm. Again, if I’m going to swap needle bearings, I want an OEM part. Let’s take a look. I’ve never had to order the needle bearing/sleeve from the ER6 shocks since I’ve always had one of these shocks on the shelf and could just press the bearing out. 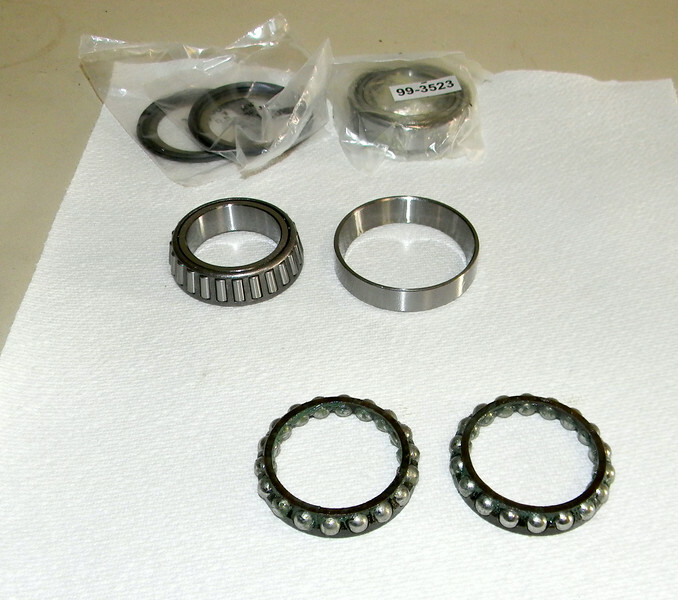 The bearing is just a mild press fit, almost a friction fit, and is easy to remove from the donor shock end. You could also remove it from the Versys shock. Don’t damage the bearing. As you might expect, the R1 shock end has a smaller ID, and needs to be bored for the ER6 bearing. 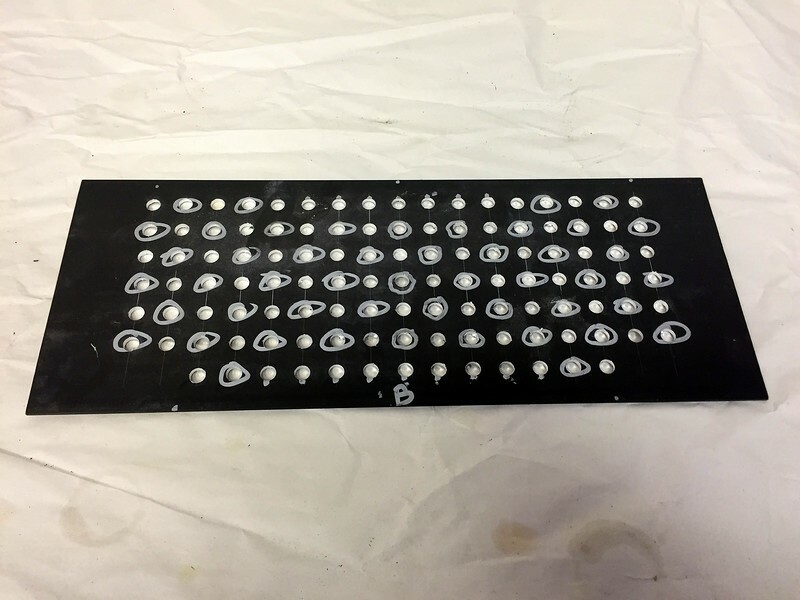 I have done this by hand, but have also had it machined, it’s a simple operation, and inexpensive. The question has been asked as to whether there’s enough material left on the R1 shock end if it’s bored for the larger diameter needle bearing bushing. All I can say is, if I haven’t managed to break one, I doubt anyone will. 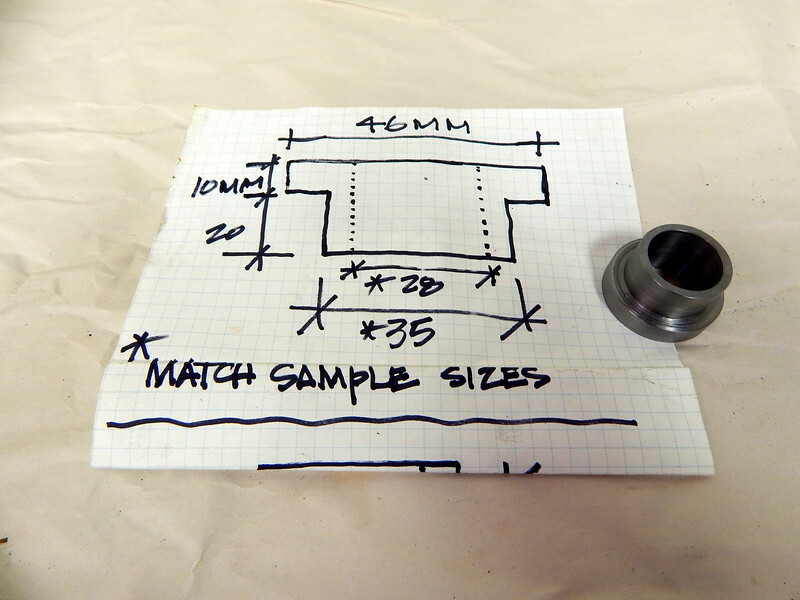 The other option many have used is to drill the steel bushing insert on the R1 to 12mm. 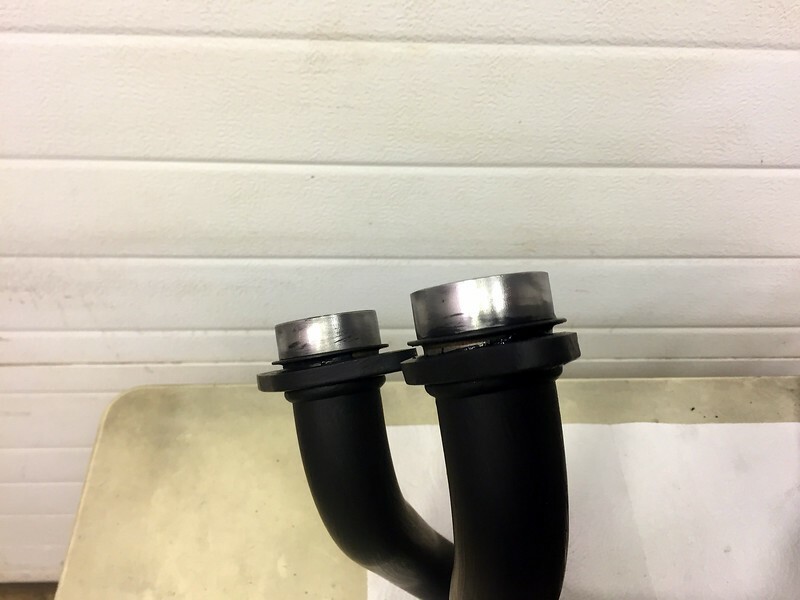 The mild steel insert has a thin sldewall, and the bore must be concentric to the original 10mm bore or the bushing is ruined. 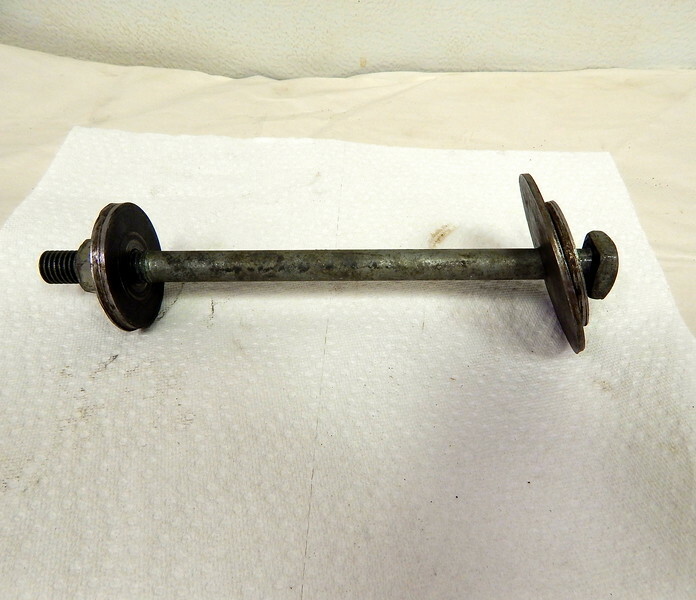 Riders have reported ruining the bushing, and there have also been reports of machine shops doing some careless work too. If I decide to use the conventional end, I’ll use a simple fixture to hold the R1 while the bushing is drilled, pretty simple. 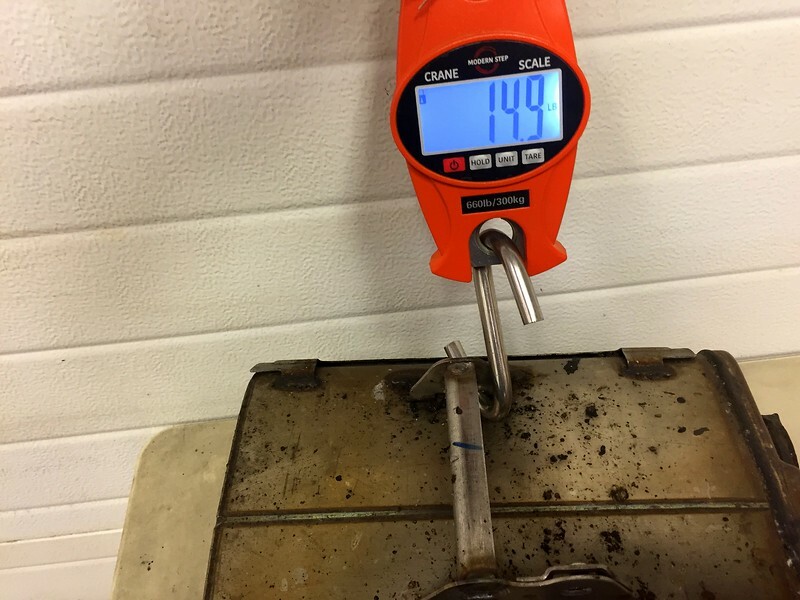 Low rpm in the drill press, cutting oil, and sharp twist drills in a few graduated sizes up to the metric equivalent of 12mm. 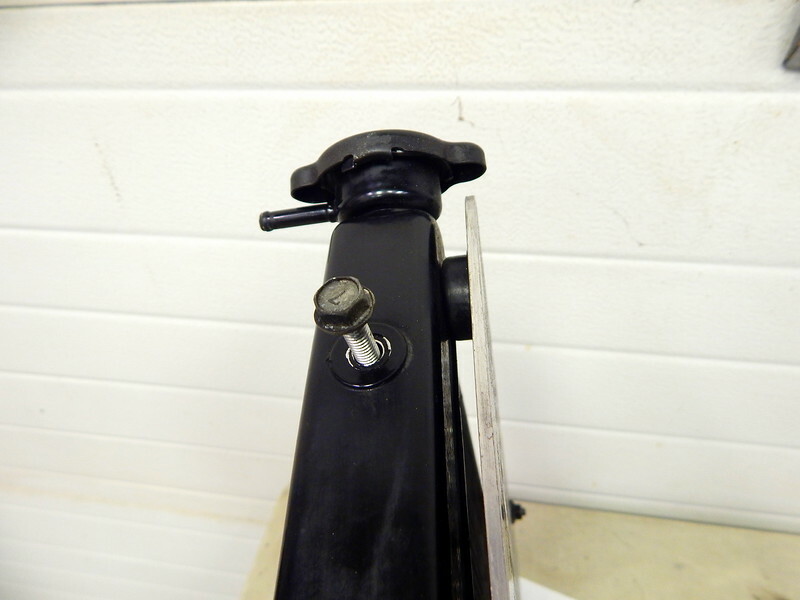 check your OEM 12mm mounting bolt with a caliper, you may find it is not exactly 12mm, plan accordingly. for a simple fixture, i'll bore a piece of scrap 2x4 to fit the diameter of the R1 reservoir, block the shock parallel to the table and square to the quill, then index the bushing insert with a twist drill that is a snug fit on 10mm. 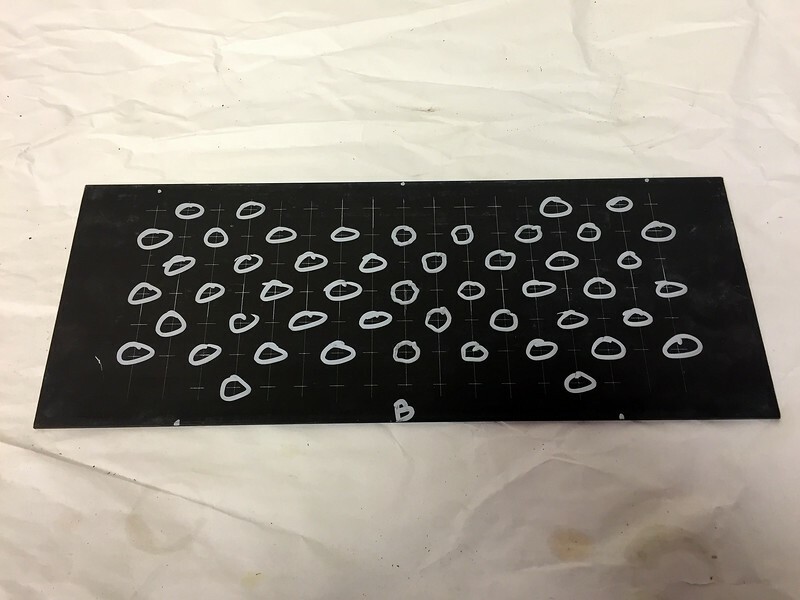 go ahead and drill the bushing with stepped twist drill sizes, you should end up with a very satisfactory concentric bore. 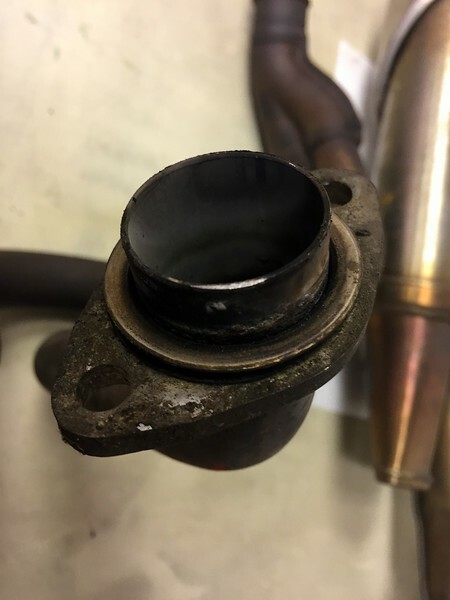 if the bore is screwed up for whatever reason, don't let it ruin your day, go to plan B, and swap in the needle bearing bushing. i've previously used DRZ400S fully adjustable forks on my Versys bikes, 49mm conventional, 300mm travel, and very solid performers. 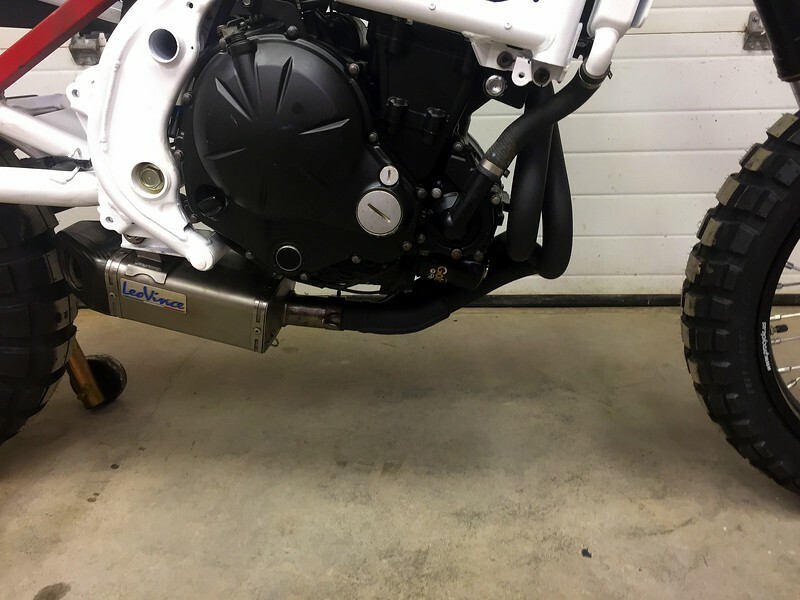 simply massive in comparison to the OEM Versys 41mm USD forks. 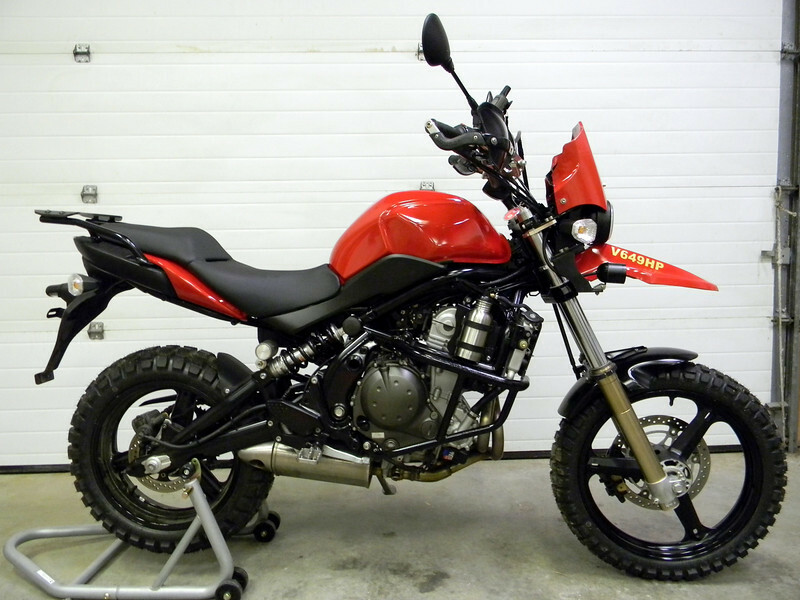 the DRZ400 forks are an easy swap to the Versys since the OEM Versys clamps are used along with inexpensive adapters. the swap recipe is well documented with both photos and narrative, mild to wild, very easy overall. 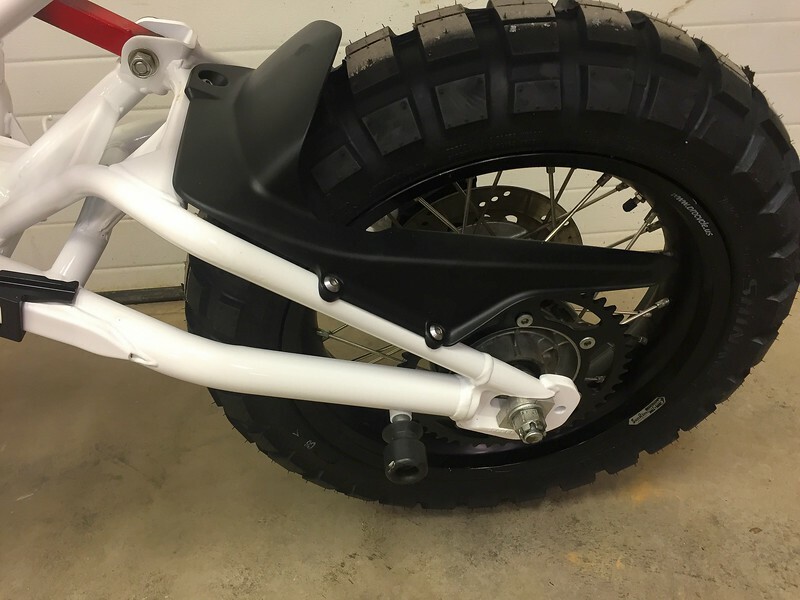 add a 19" front wheel at the same time, then take your moto places you hadn't considered possible. instead of DRZ forks, the 2019 Versys uses KX450 48mm USD forks, also fully adjustable, and 300mm travel. 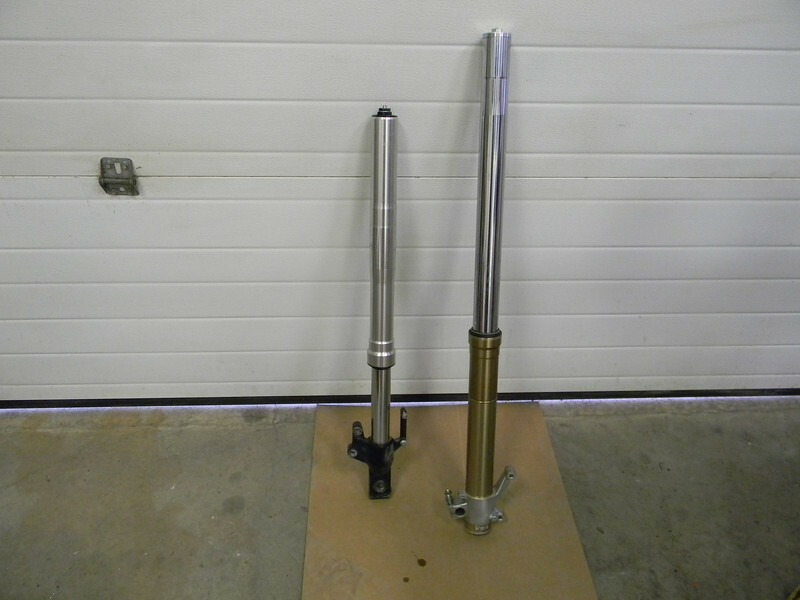 these forks are used with the KX450 clamps and are easy to fit. 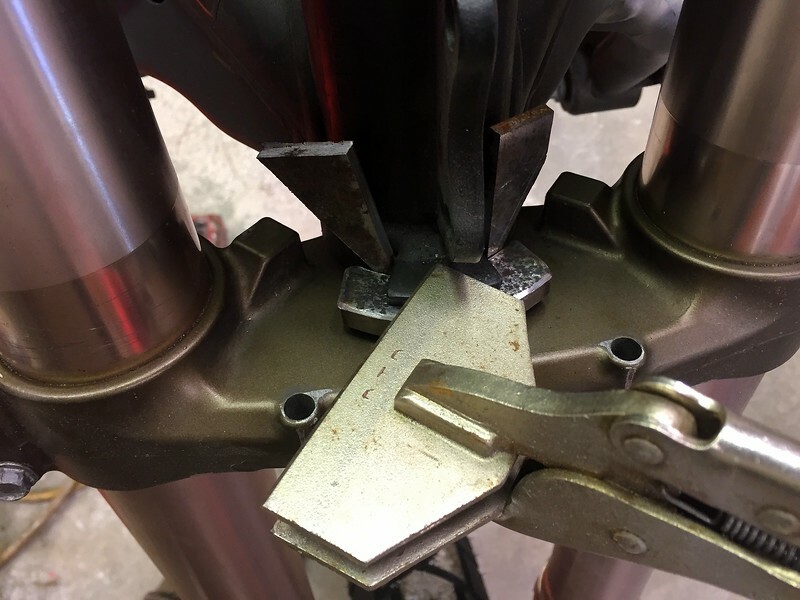 most clamps that fit forks sourced from the dirtbike world have a smaller center dimension so you want the pinch bolts facing the side or front to avoid interference. other 48mm forks could also be used, but forks from a Kawasaki seemed appropriate for the Versys. personally, i wouldn't fool with forks having stanchions less than 48mm, ain't worth the effort. worldwide, "Go big, or go home" will translate. first, get rid of those stupid cheap OEM steering bearings, those price point things don't work well, have a short life, were probably never greased at the factory, and are not suited for use with the big suspension. don't damage the receivers or races during the R&R process, and make sure that the new races are fully seated. note that the race sits slightly below the top edge of the receiver when seated, same on the bottom. 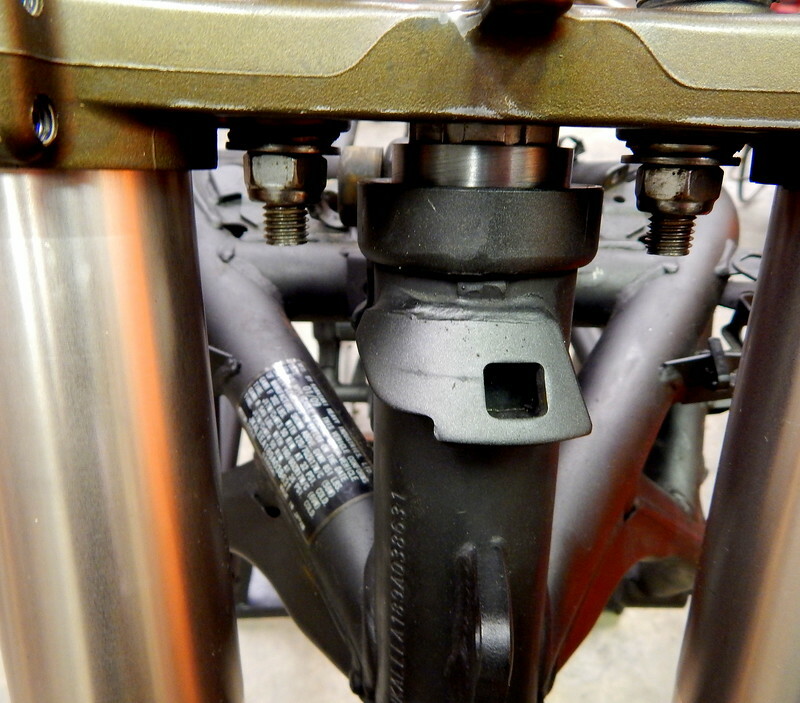 the KX450 stem does not match the Versys stem at the top in either length or diameter, but the 450 bearing race does work with the Versys roller bearing on the bottom, making the swap very straight forward. 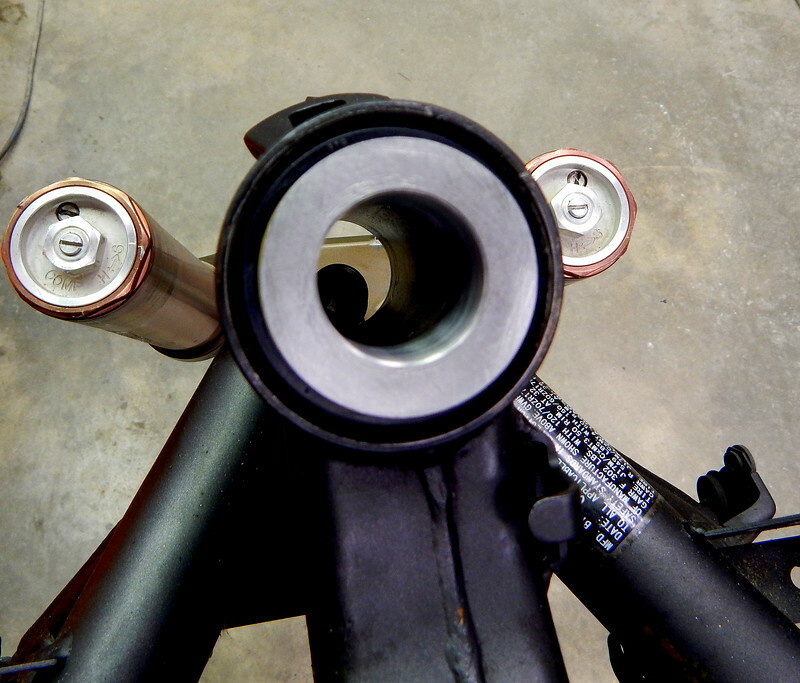 all that's needed is an adapter that mates the 450 stem OD to the Versys bearing ID, plus the height adjustment. the stem nut was fully engaged with the 10mm adapter flange, but i liked 7mm better and had it cut down to that dimension. 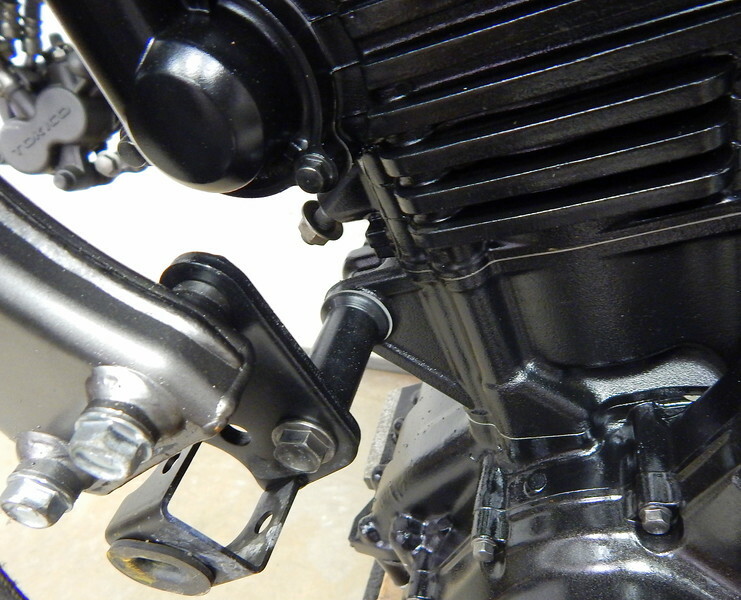 the steering stop on the Versys frame head stock was sized and positioned for the Versys clamps/forks and does not work with the KX clamps/forks setup, it needs fixin'. 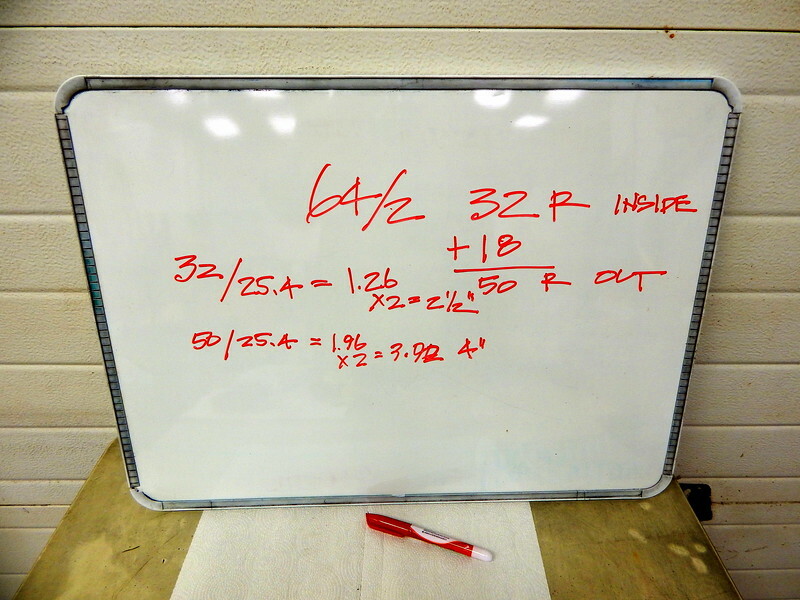 i didn't want to add a piece of junk, wouldn't look right, better pick up the OD of the head stock, get out the white board, do some high level arithmetic...damn, this is hard work. 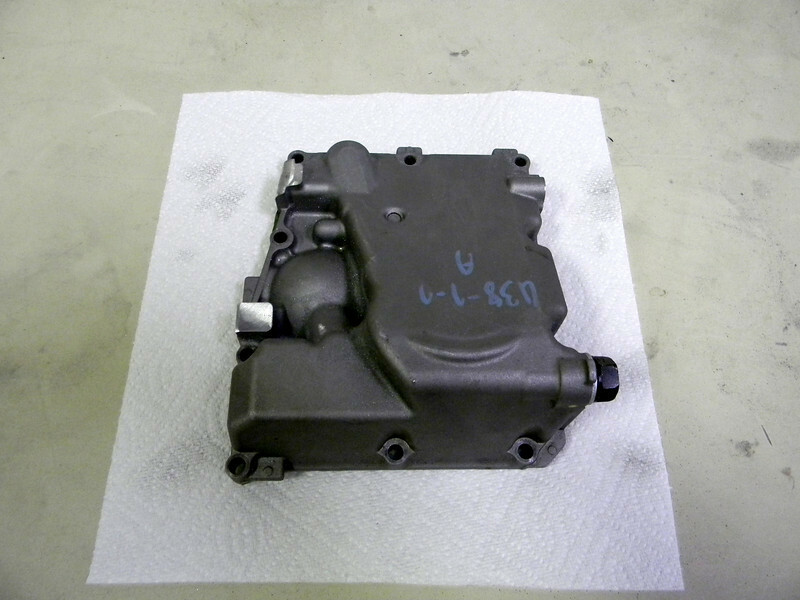 piece of scrap steel, 2.5" and 4" hole saws, single pilot hole, then make the cuts to 90%, snap it apart, smooth the edges, and you have a steering stop with perfect ID and OD radii. 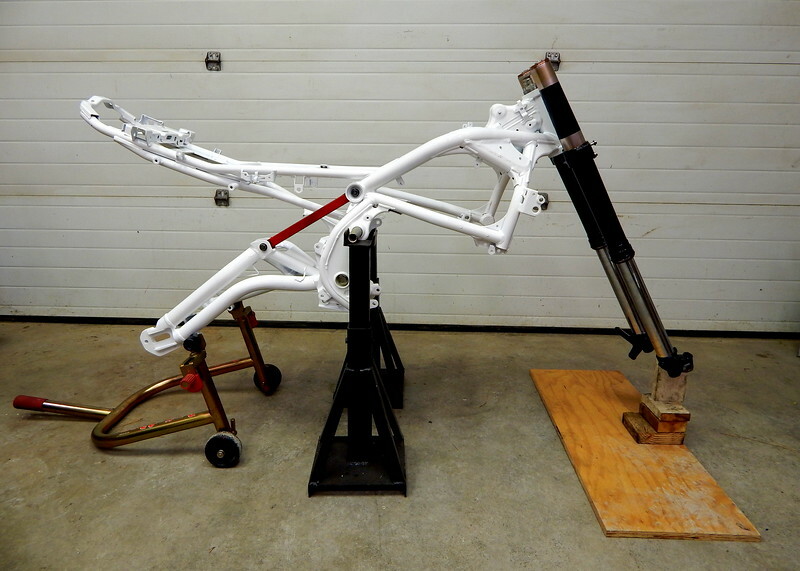 now ya have an installed and functioning set of KX450 forks on the Versys frame. the previous bikes have been all over the USA and Canada, some miles across "road" conditions you would have to be there to believe...all on cast wheels. riders don't seem to think cast wheels are up to the task in rough conditions under a big bike, but how can that argument be made to a rider that went way the heck out there, then came way the heck back, all on cast wheels. tens of thousands of miles on gravel, never bent a cast wheel, never broke a cast wheel, ok, ok, i did scratch the paint from time to time. let's put the issue to rest, it's baloney. y'all got the cast wheels, get on out there, don't park the damn bike. 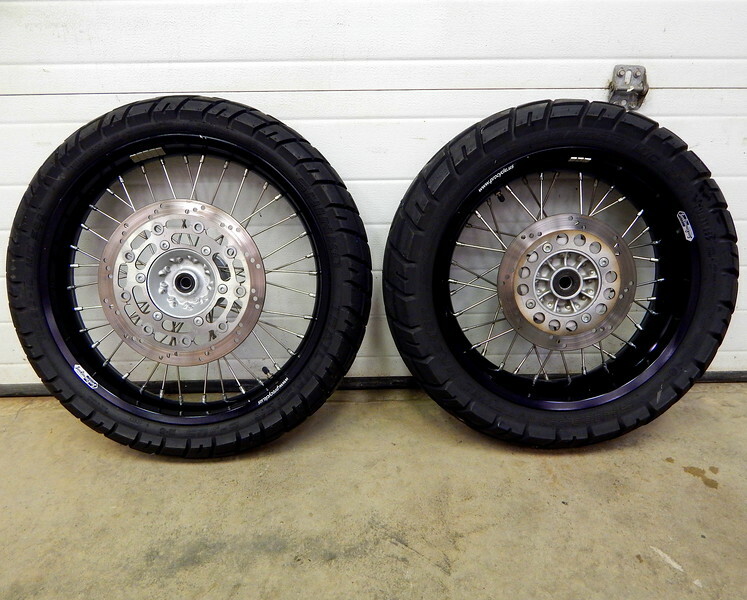 so with all those cast wheel miles, coupled with claims that i would never ever run spoke wheels, i promptly sourced a very nice set of spoke wheels for the 2019 Versys, let's check the view from the other side. 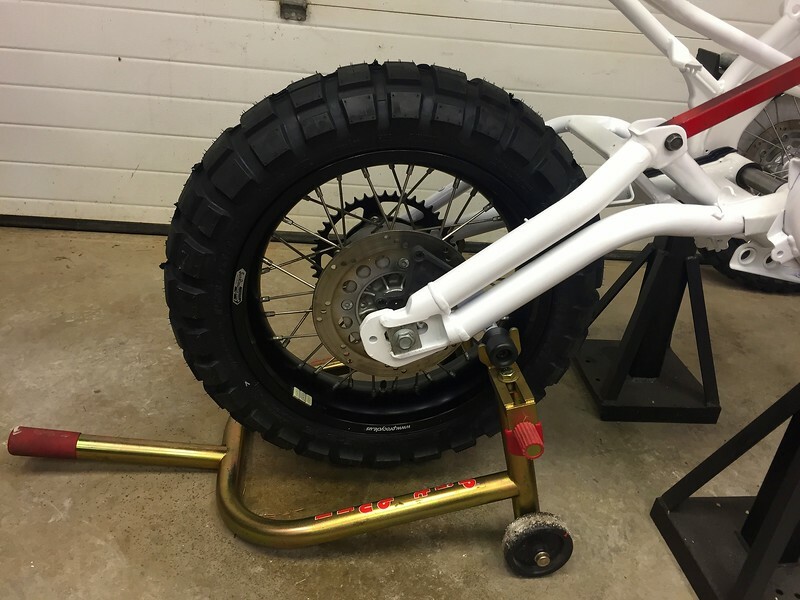 i already had a cast rear wheel for this new moto and was looking for a cast DL1000 19" front when i stumbled on a spoke set that i thought i could make work. 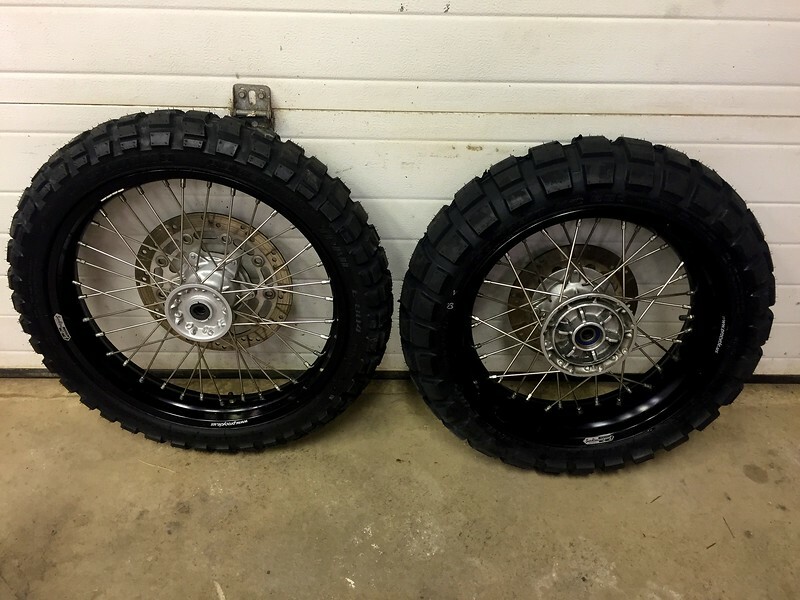 this set of wheels came from Procycle and were custom built for a 2nd gen DR650 in 17/19 at substantial expense. 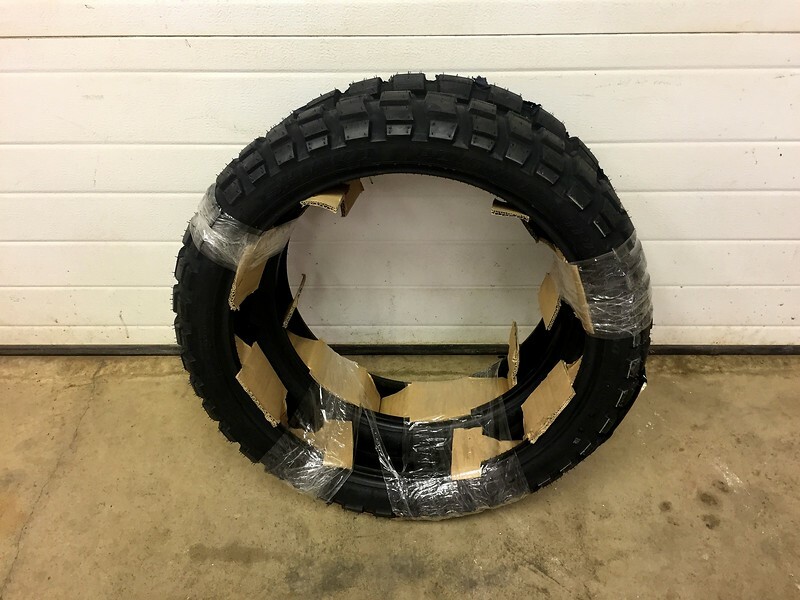 this set was ordered turnkey, complete with Shinko 705s, and ready to install. 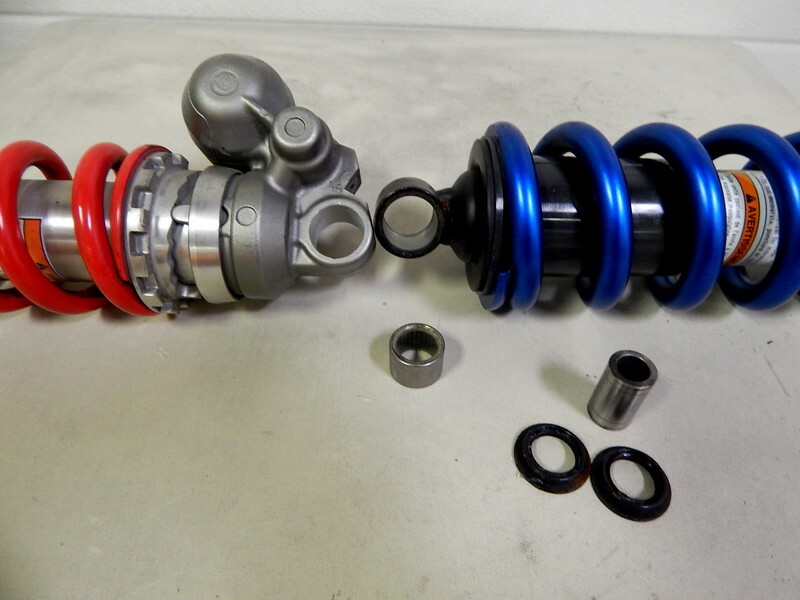 check it out on Procycle, the price for this set will take your breath away. the guy who purchased them decided to sell for some reason, and i bought them for next to nuthin' relative to the original cost. some nubs were still on the 705s. the rims will eventually be sealed to run tubeless. those 705s do work on these bikes, but i had other things in mind regarding travel, so a 804/805 set showed up at the door. some day i'll put up a tutorial on changing tires by hand, no tire machine for me, it's easy. i guess i'm authorized to say that after the R&R on dozens of tires. DaveC, chid, Buffalo_Bob and 1 others like this. 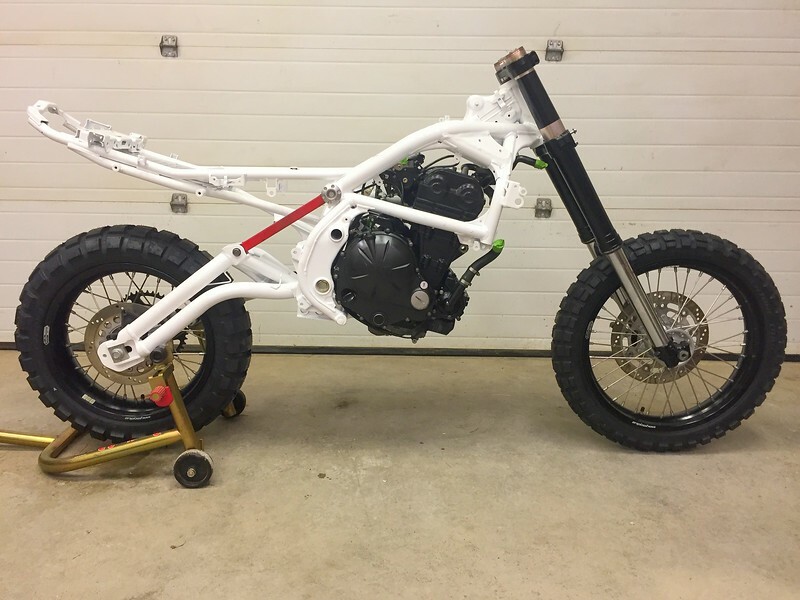 jdrocks , you are building a bike from scratch and I am lost in words. 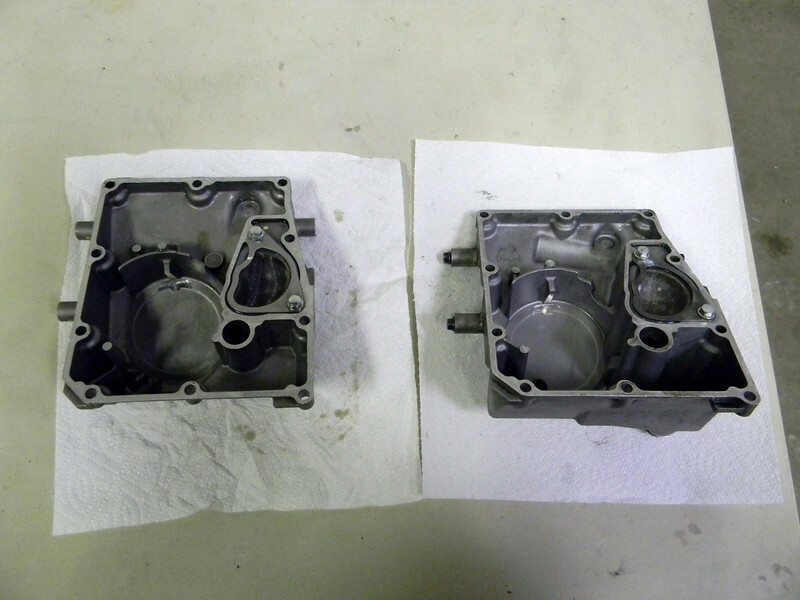 Remind me of my younger days when i build a EFI engine for a VW1300. 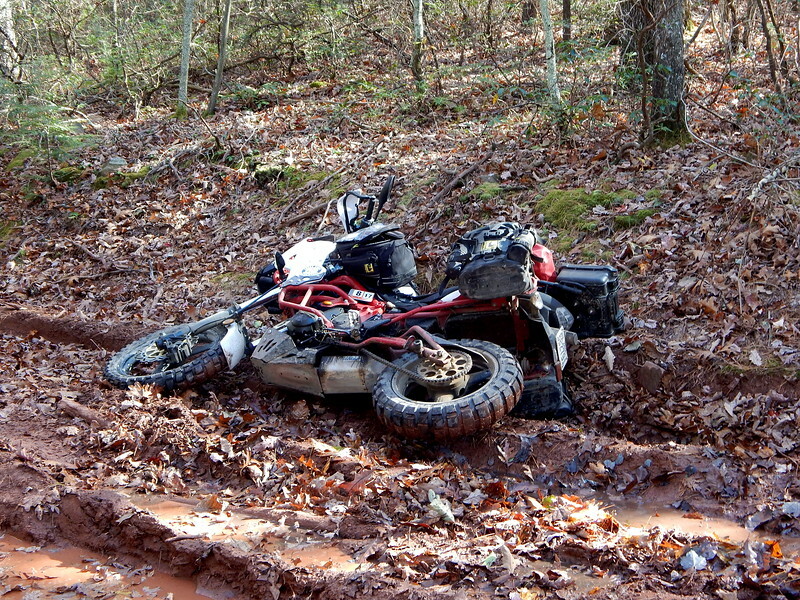 that's it, why wait for some moto company to offer up an expensive bike that fits some of your performance criteria, but is easily damaged in the event of a drop, and is expensive to fix, not to mention expensive to maintain. the flip side, build your own bike that checks off all the boxes, is ultra cheap, is very rugged and not easily damaged, but cheap to repair if it is. 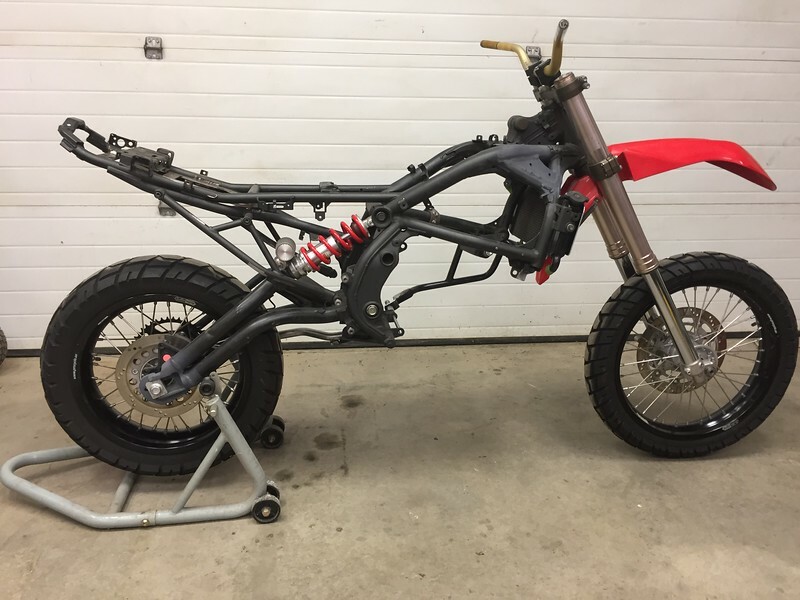 these bikes are all about cheap used parts, only the occasion items are purchased new, like tires, or parts that are very infrequently found used no matter how hard you search. all these bikes have been flopped numerous times, sometimes due to very trying conditions, sometimes due to bad decisions, sometimes due to lack of skill. the idea is to jump the moto back up, and ride away...not break something and face a long damn walk. 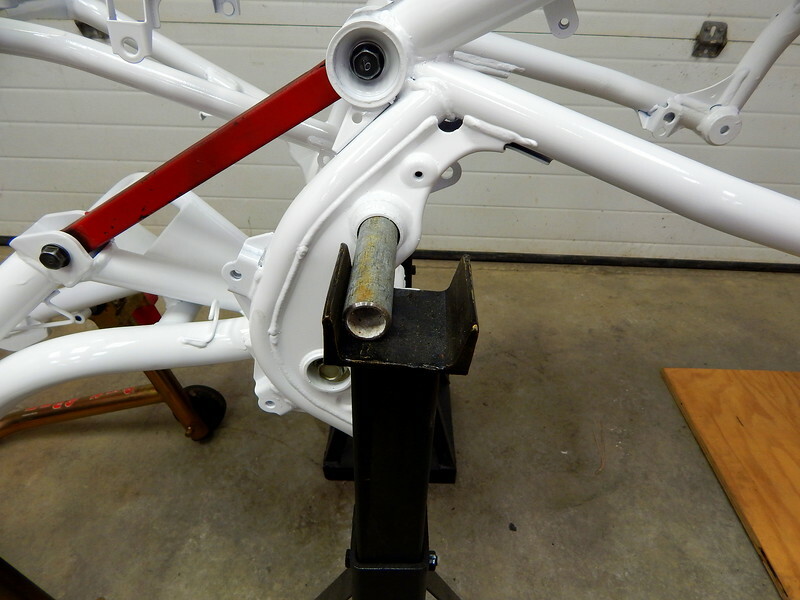 the bikes are easy to build, require an absolute minimum of machine work, and are well documented. there's not much guesswork left for anyone thinking about a clone. i've fielded questions about building these bikes from dozens of countries representing all continents except Antarctica, i guess riders like the "build your own" concept. 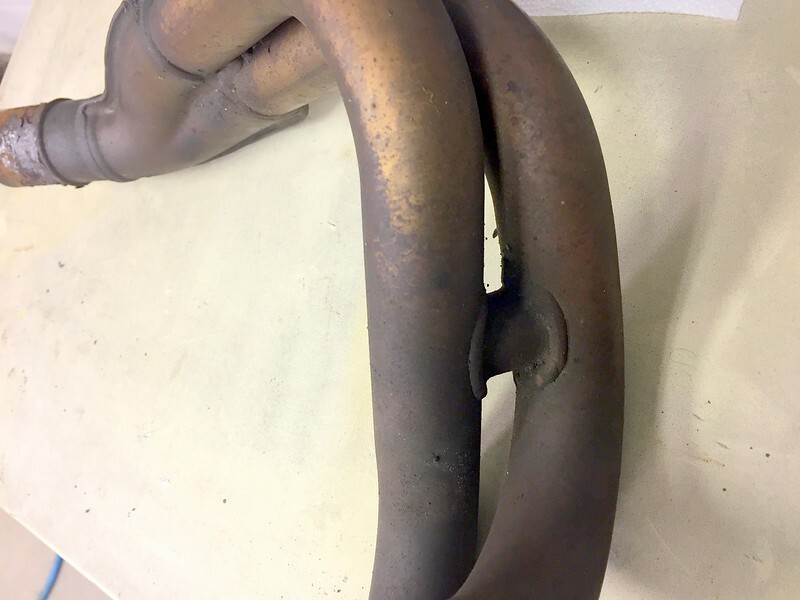 the USA is awash in cheap moto parts, and modifications are not regulated for the most part, contrary to laws in some other countries. 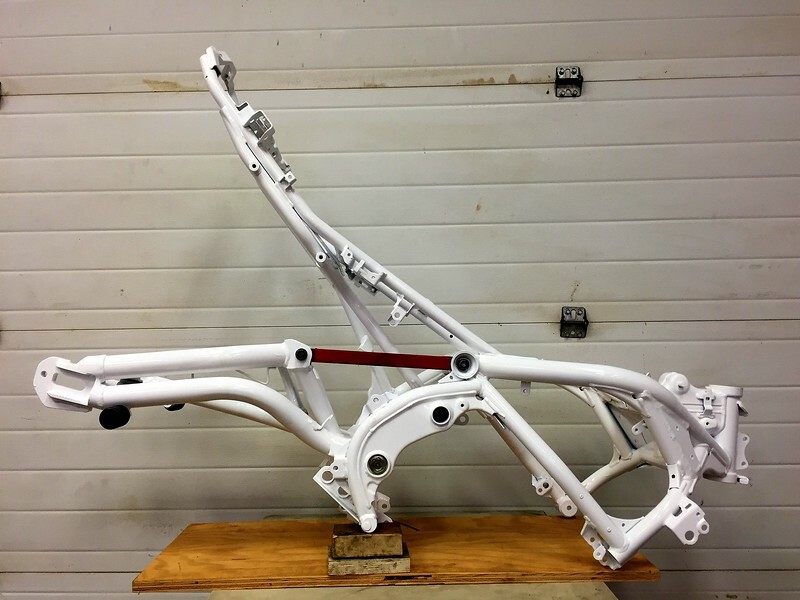 a moto that's easy to build in the States may not even be possible in other countries. speaking of cheap, i expect the 2019 Versys to be turnkey, road ready, and fully equipped, for 500 USD greenbacks...the total out of pocket cost exclusive of the new tires, which technically i didn't need since the 705s were near new. DaveC, Fastoman and 16VGTIDave like this. 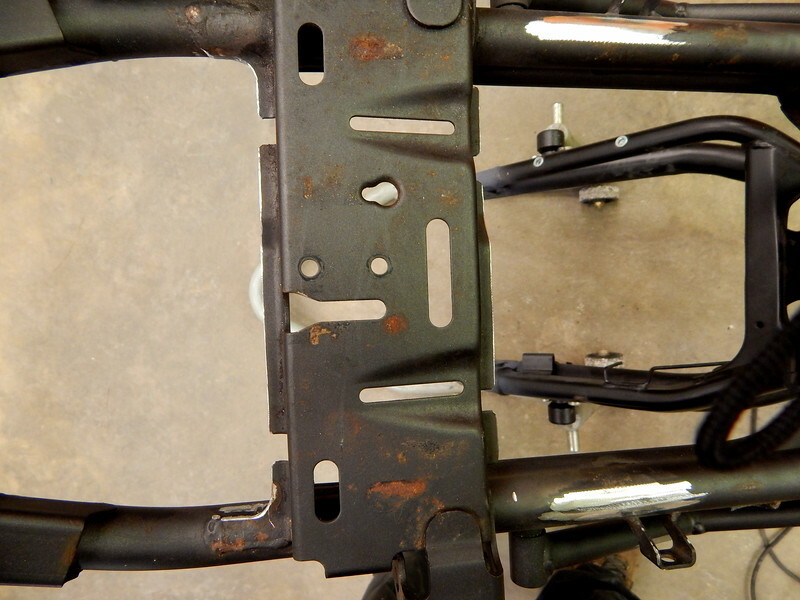 extending the swingarm moves the axle back and the tire away from the subframe assembly, now the job is half way down the road to making the room for added rear suspension travel. y'all want 200mm plus of rear travel, start cuttin'. nope, that's not going to work, just hit the fender liner delete buttom, get rid of the whole damn thing. trimmed out all the unnecessary junk..
that's it, phase two complete, now there's room for rear suspension travel...a measured 215mm, i'm hopeful that i won't break anything under there now. onewizard and 16VGTIDave like this. 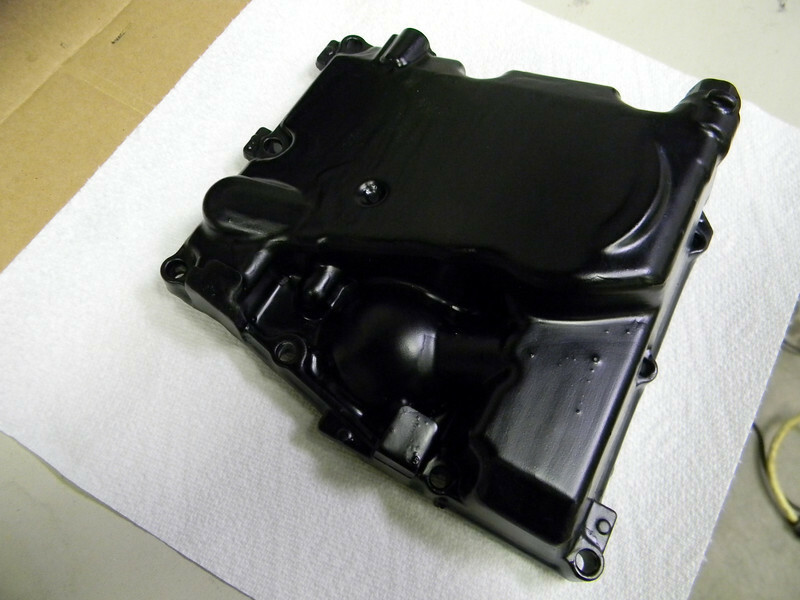 i shoot Summit single stage urethane for most moto parts, a good value, and very durable. these are not show bikes and the paint work is not pro level work, but looks pretty damn good from say...about 10-15 feet. DaveC, chid and 16VGTIDave like this. Last edited by jdrocks; 03-26-2019 at 06:08 AM. these bikes get the cop motor as mentioned earlier, but my search criteria might be considered a little peculiar...a low mile motor, and free. that's right, the new moto needs a free motor to stay on target with my ultra low budget bike build. takes some diligent shopping for exactly the right deal, but i knew from past experience that the goal was achievable, i'd done the same thing more than once and have the stories to match. i finally located a candidate that checked off many of the boxes, late model, low miles, salable parts, and after much dickering i came home with another complete EX650 parts bike at a ridiculously low purchase price. i immediately dismantled the bike, sold some parts, got my money back and then some. yup, free cop motor, mission complete. 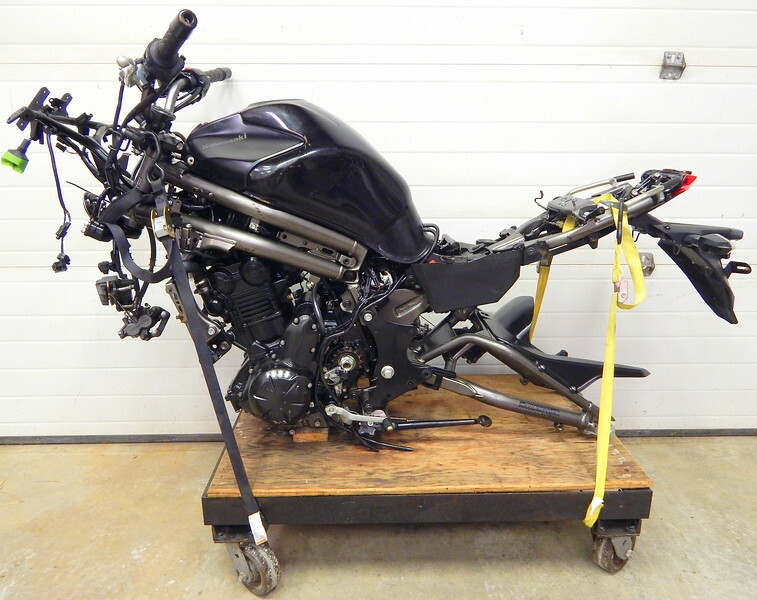 the 2012 EX650 sportbike was a new generation moto with a 100% redesigned frame, double top tube, but the horizontal tube that backed up the front motor mounts was deleted. 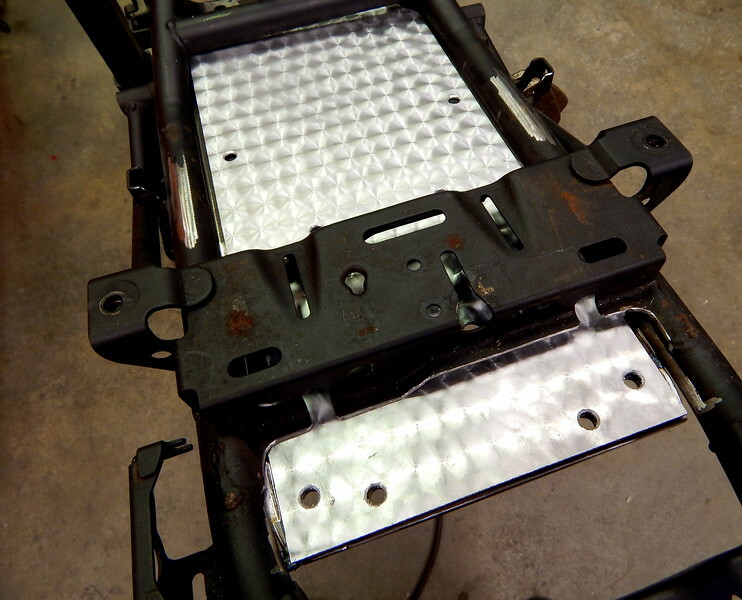 the new design had a composite vertical leg connecting the cast motor mount lugs to the structure above, the software must have said the solution was acceptable, but not from where i was sitting. 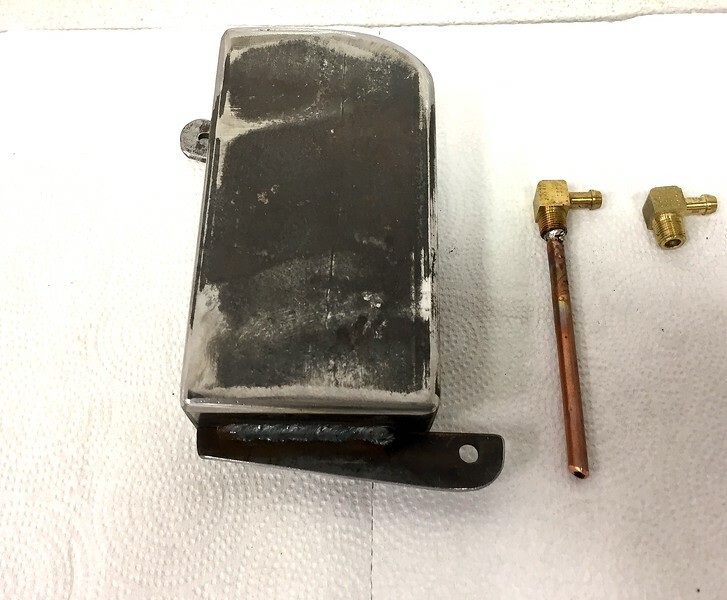 drop the bike, and just about any hard hit on that member would displace it just enough the crack the motor mount lug on the engine case, now the bike is totaled. 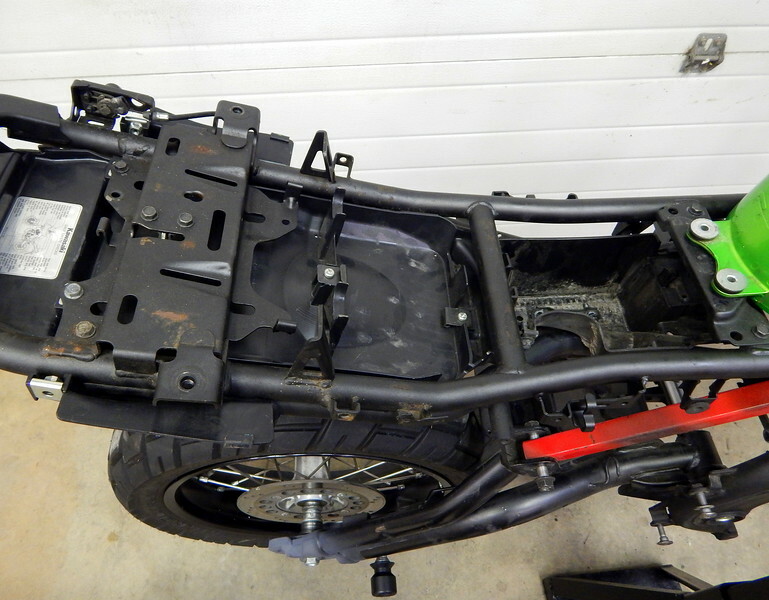 the bike's on wheels, we got a roller now, so it can be placed on the lift, that cop motor that was just installed needs some minor surgery, a little nip and tuck in the belly area...specifically, the oil pan, OMG. 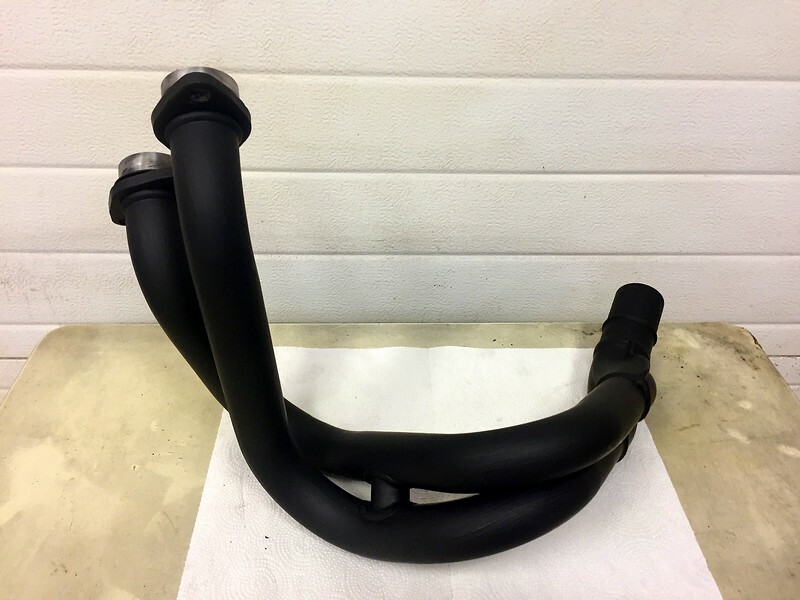 the ER6 lineup went to side drain oil pans at the same time Kawasaki started using one piece exhaust systems, eliminating the you-know-what appearance of the earlier bottom spigot drains. 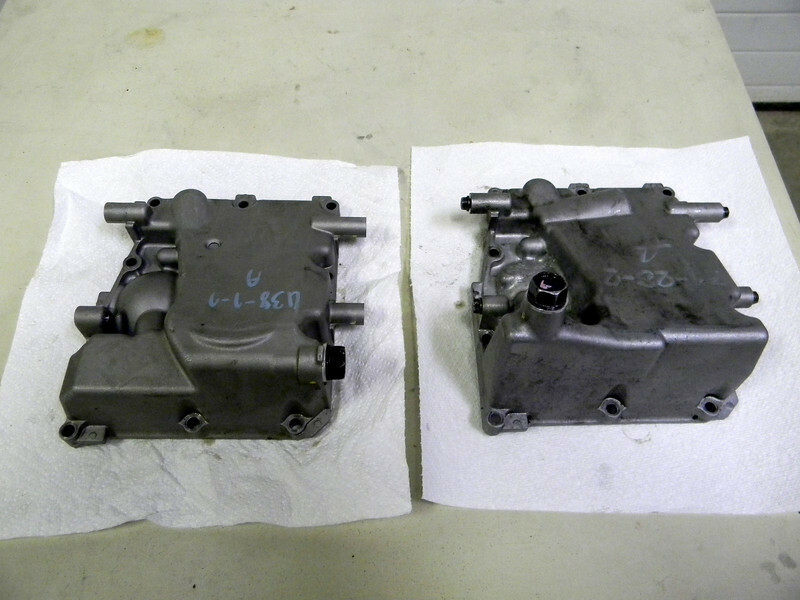 when the 2012 EX650 came out with the side drain pan, i immediately swapped that style pan on any cop motor motos i was working on. the 2012 pan already had the side drain, case closed, well, not quite. 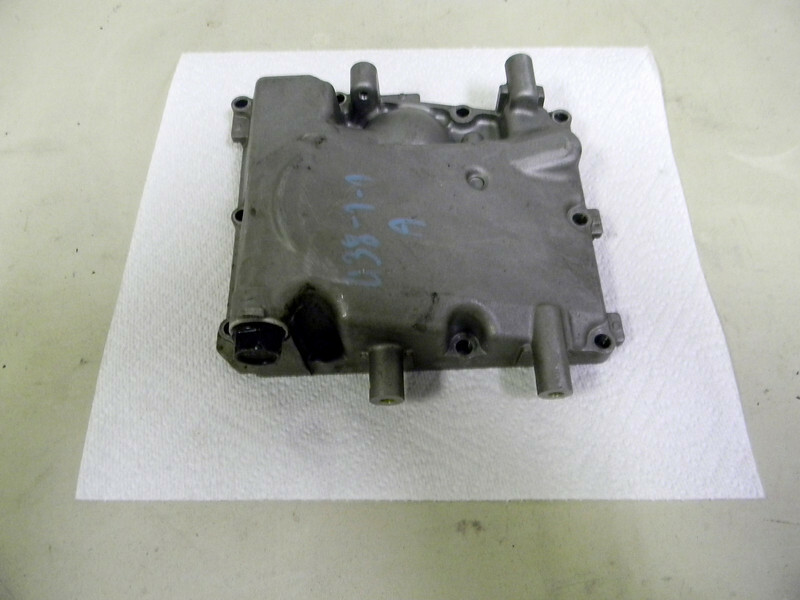 the oil pans appear to have different capacities, but the oil fill spec stayed the same. 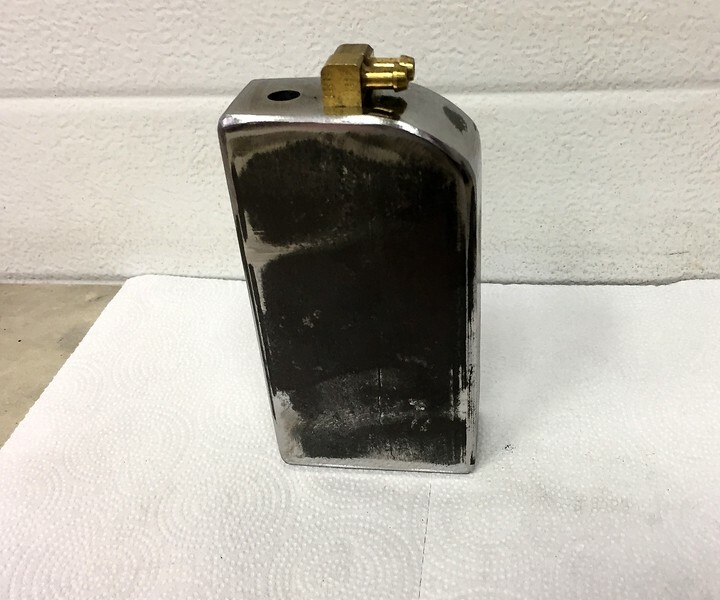 these pans are a very light aluminum casting with about a 3mm sidewall, not egg shell fragile, but they are not designed to take much abuse either. with that in mind, those belly fairing mounting lugs had to go, bang on one of those and the pan will crack or break a chunk out of the sidewall. nothing will park a bike faster than losing the engine oil, not to mention other possible consequences. can't have that, even though i run a gravel guard, doesn't matter to me, those lugs get the knife. use some care when you cut and smooth, remember, the pan is thin. 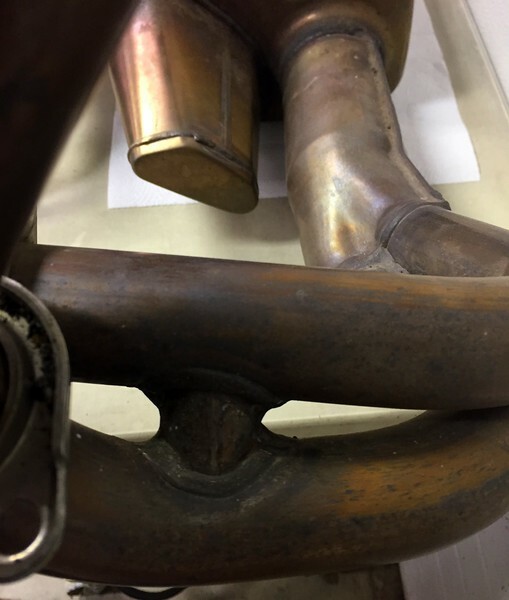 the lugs are blind tapped, and the bottom of the tap is about as far as you go. 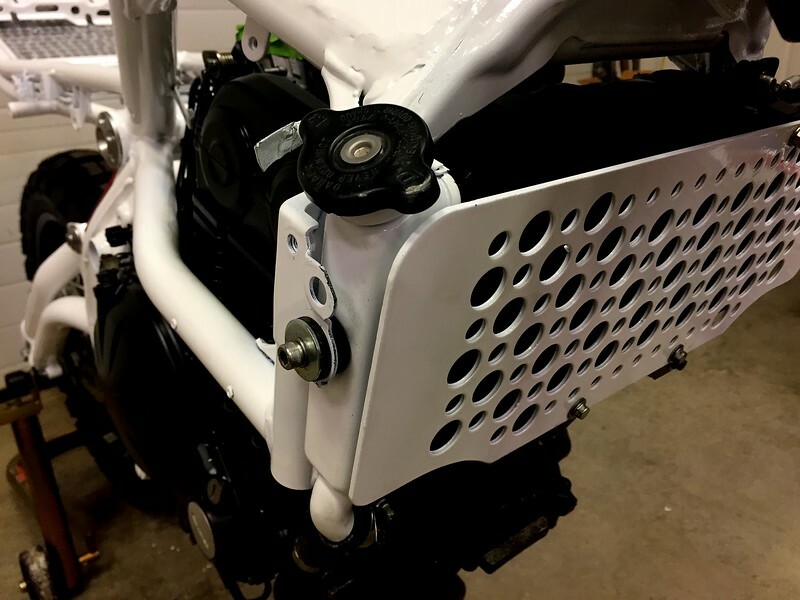 this new moto gets a custom radiator guard, the design similar to guards i've used previously, now proven on these bikes after years of use across all conditions. 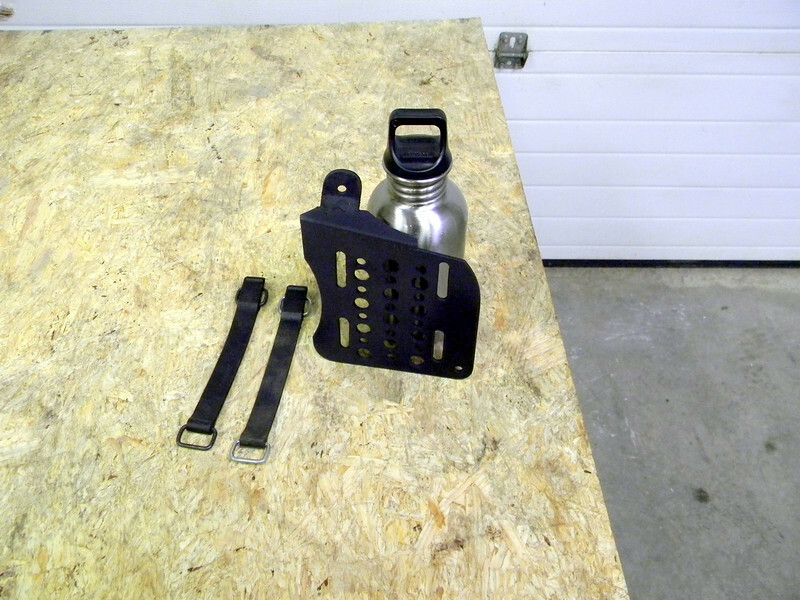 with the transverse radiator mount, these bikes need a guard even for strictly street use. buy one, fabricate one, your choice, but get it on there. 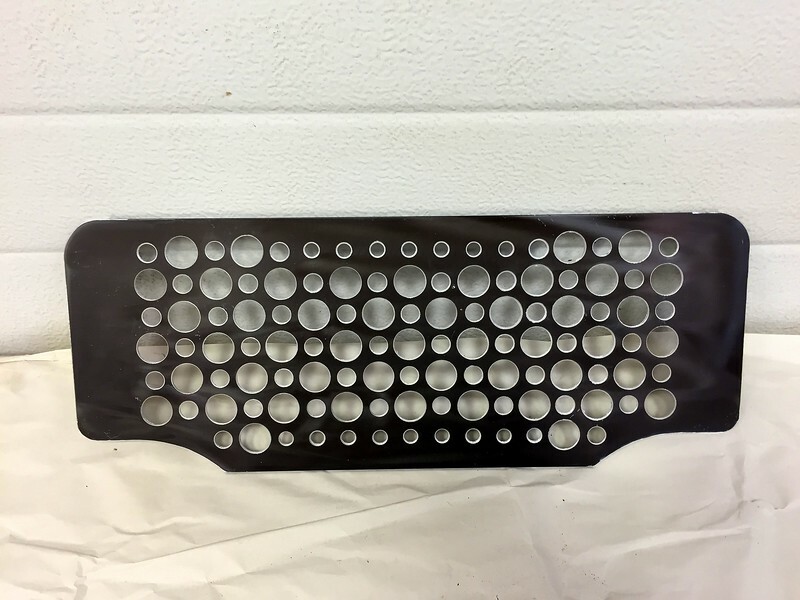 the radiator needs plenty of air, or you're going to see the temp warning light, keep that in mind when you choose a guard design. even some of the manufactured guards don't look like they have enough free air. my guards are fabbed from scrap aluminum, nominal 3mm, and are sized to cover the entire radiator including end caps. 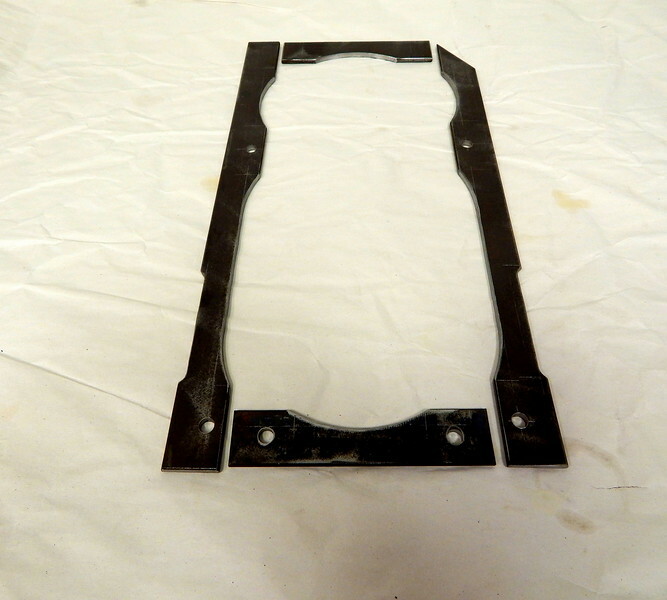 i use a standoff mounting system, the guard surface sits in front of the radiator by 10-12mm, making it easier to flush the core and allowing the guard to deflect under impact by something large. 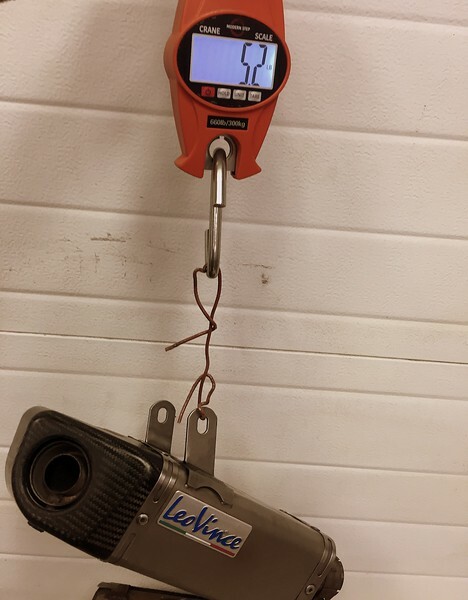 quick note, you have a metric bike, and you're fabbing a part here, maybe another part there, forget imperial scales, always use a metric scale, it's easier. don't even think about using a pencil or marker for layout, use a scribe for accuracy. 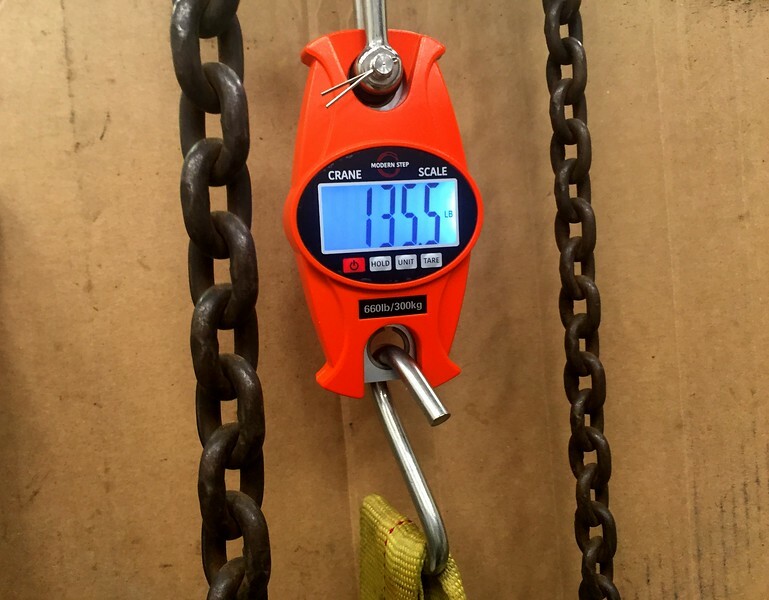 if you don't have these simple tools, they're very cheap online or at the bigbox. frankly, never buy another scale that is not at least an imperial/metric combo. 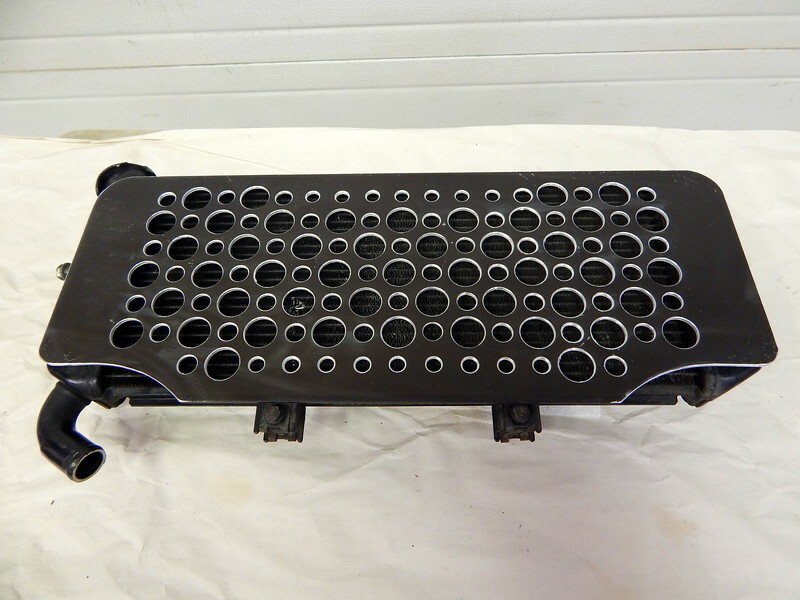 the radiator gets additional protection on this moto build, more on that later. cop motor installed, i need an exhaust system for the beast. 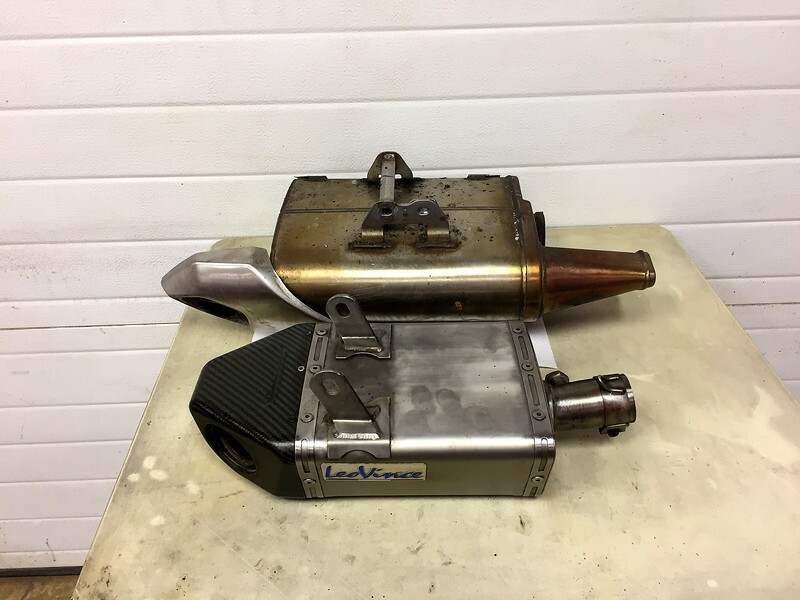 the ER6 platform went from a conventional two piece exhaust, header plus silencer, to a one piece design, first with the EX650 in 2012, then followed by the Versys in 2015.
my EX650 parts bike was a 2012, and came with the one piece, lucky me, i got a free chunk of tubing with a heavy as all heck nuclear reactor attached to the end. sorry, ain't going to use that one piece for several reasons, but i'll pick one near the top of the list, weight. plus, i already had one of those Leo Vince shoe box slip-ons on the shelf, used, but in good shape. 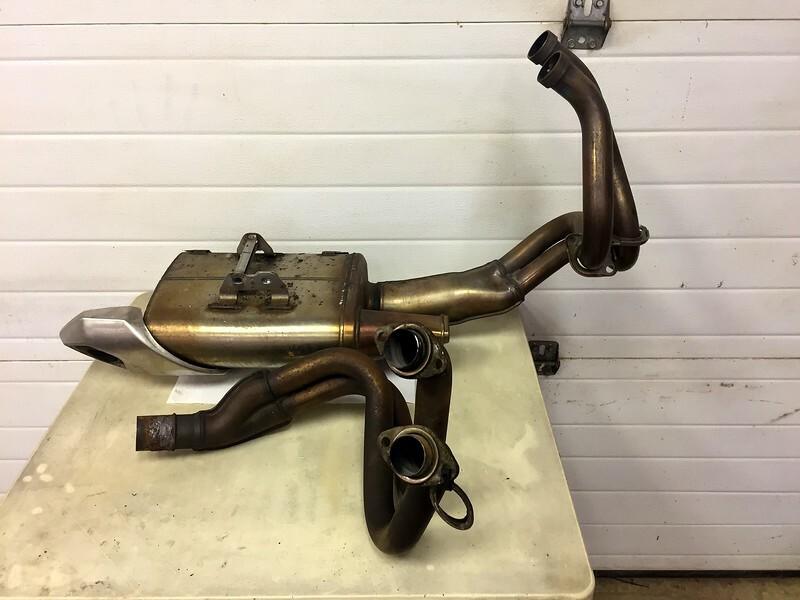 no expensive one piece exhaust for me, keep it cheap. DaveC, chid, asphaltaddict33 and 1 others like this. there's still plenty of build info to put up, but i'm still sitting on the fence as to whether this forum is the right place for it. if the material only gets a few views per day, frankly, it's not worth the effort. of course, the view counter might not be functioning, the forum has been notorious for technical glitches from day one. 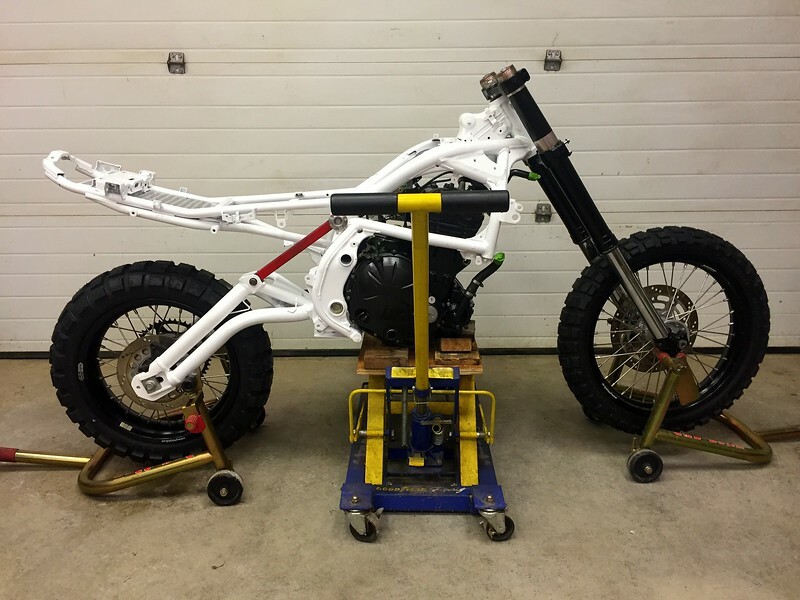 a big part of these build threads is to demonstrate what can be done with these bikes by the rider with hobbyist level skills in his/hers own garage. there are no expensive power tools used, and i don't own any machine tools. ok, i do have some welders, but my favorite welder for moto work is a 120V wire welder i found used and cheap. i do occasionally look at other parts of the forum, and see threads or posts that state "You have to do this" or "You can't do that", and i'm thinking about sticking my nose in there to offer up a viewpoint based on personal experience with these bikes over 100,000 plus miles, sometimes in tough conditions...nope, ain't gettin' in the middle of that stuff any more, i'm stayin' down here in the basement. anyone with questions can ask here, i'll help where i can. stay tuned, there might be more to follow. Please don't stop, I find it extremely interesting and full of info! onewizard, quexpress, Buffalo_Bob and 1 others like this. If you are looking for more input, I would suggest changing to The 2019 Versys / jdrocks Build or something like that. Your thread, your call. already had my hands on that, progress underway, outcome undetermined. the basement isn't hard to find, this forum ain't that big. forum glitches, yeah, now the "Instant email notification" doesn't work, at least for this inmate and this thread. Please, don't stop posting! I for one would be really bummed out if you stopped posting your awesome project! I appreciate the step by step posts and can imagine (in my dreams) completing one just like it! Need a test rider when you're done? ...Need a test rider when you're done? might, ya never know. these bikes are big mofos, must scare people a little. i only granted one request for a test ride, a guy i already knew from a couple rider get togethers, and he said he was just going to ride up to the next intersection, then come back...except he didn't come back. the intersection was only a mile away. WTF? 30 minutes later, he showed up, all apologies "I wanted to turn around, but I couldn't help myself, I just kept goin', it was so much fun." a month later, and he was building a clone of the V649. the build experience is kinda catchy. these bikes can go places, and he had plenty of places in mind. Buffalo_Bob and 16VGTIDave like this. 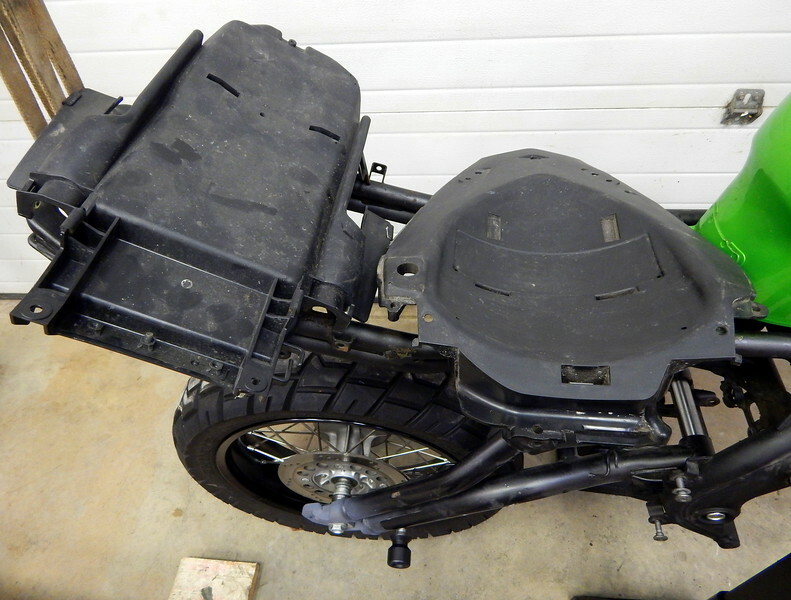 the OEM coolant tank doesn't work on these bikes, too big, poorly located, and easily damaged plastic construction. i can't have any of that. 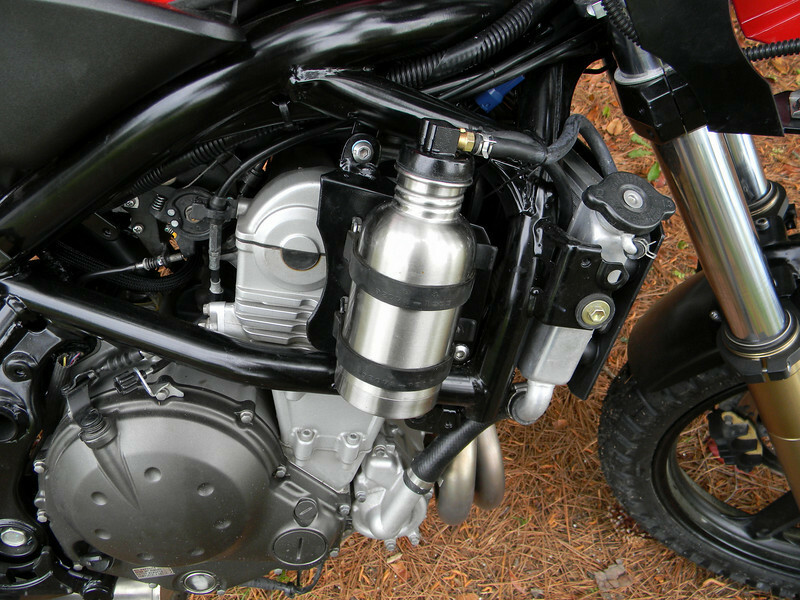 the bottle didn't look too bad on the bike, but i eventually got tired of it, too conspicuous, and even this mounting location didn't enhance the survivability of the tank as much as i would like to see. 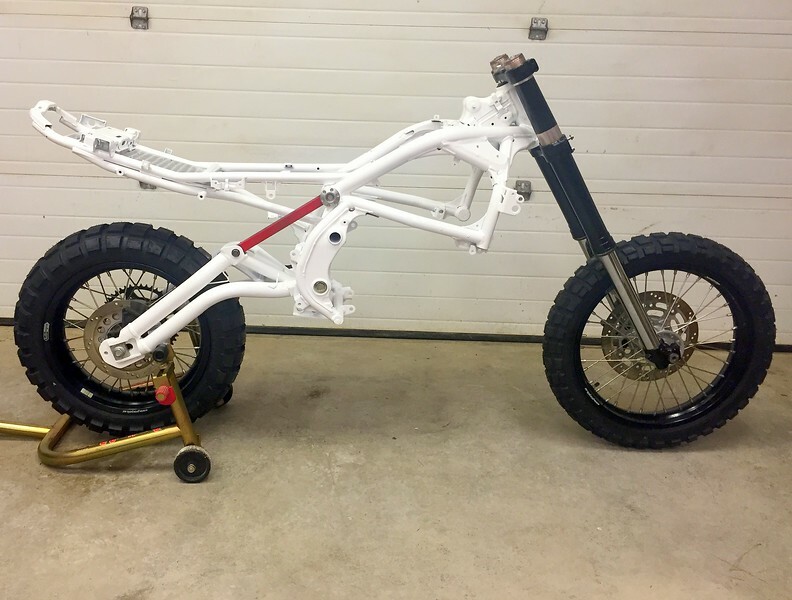 the new design criteria said the tank should be smaller at 3-400ml, steel construction, sit behind the main frame tube, and hard mount directly to existing attachment points on the frame. small, inconspicuous, tuck in tight, got it.